© 2002, © 2018 by Paul Freeman. Revised 2/18/18. 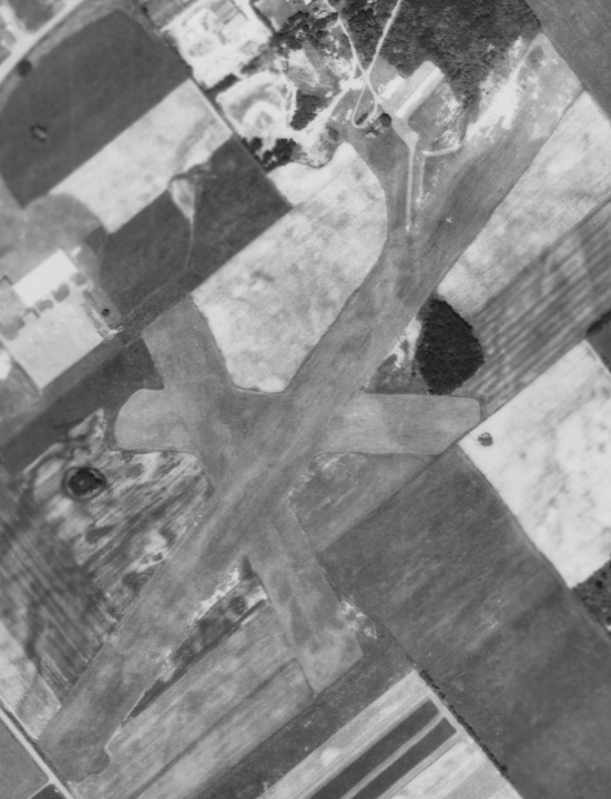 Hughesville Airport, as depicted on an 8/3/38 aerial view. The Hughesville Airport was constructed adjacent to the Lycoming County Fairground. According to Wikipedia, “A special edition to the fairgrounds was an airplane landing field. Construction of hangars & a 1,700' runway was completed. On 5/14/29, Amelia Earhart of Transatlantic flight fame, made an emergency landing in her plane at the landing field on the Hughesville Fairgrounds. 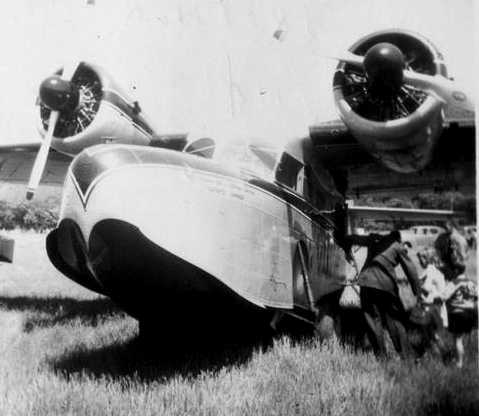 Earhart had intentions of landing at Bellefonte for refueling but lost her way. She noticed then landing field in the middle of the fairgrounds & took advantage of it. The official opening and dedication took place on September 3-5, 1930. 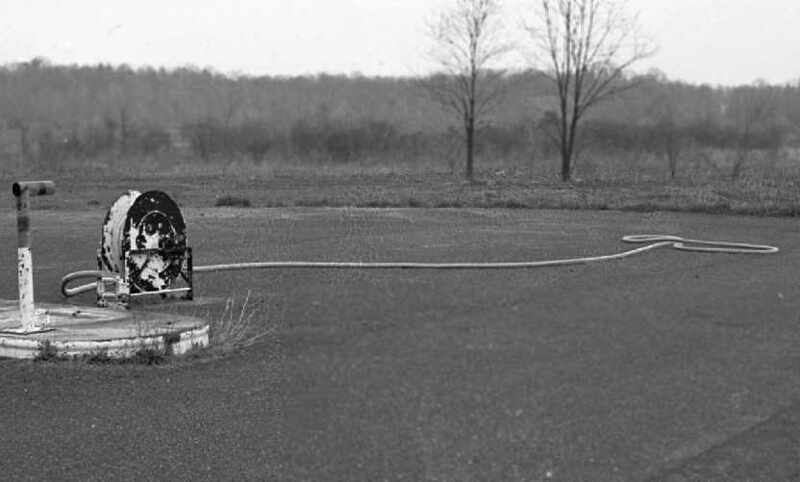 The Hughesville Airport was considered an important refueling stop on a direct route between New York City & Cleveland. 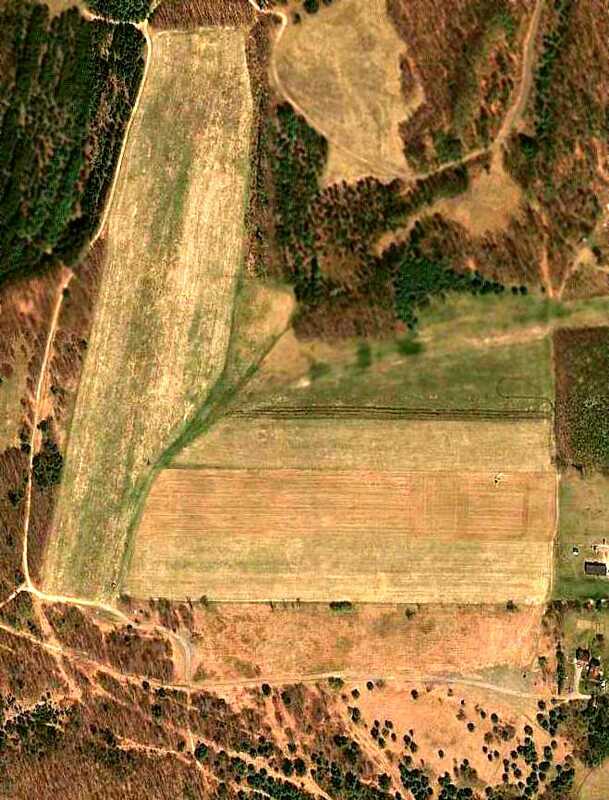 The earliest depiction which has been located of Hughesville Airport was an 8/3/38 aerial view. 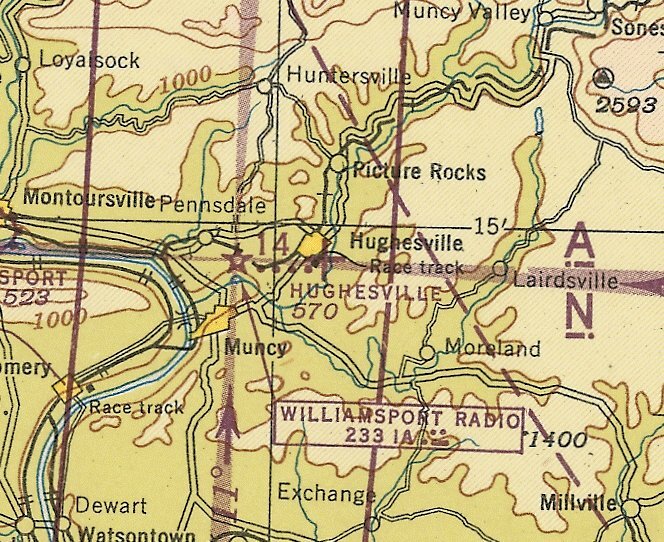 which depicted Hughesville as a commercial/municipal airport. 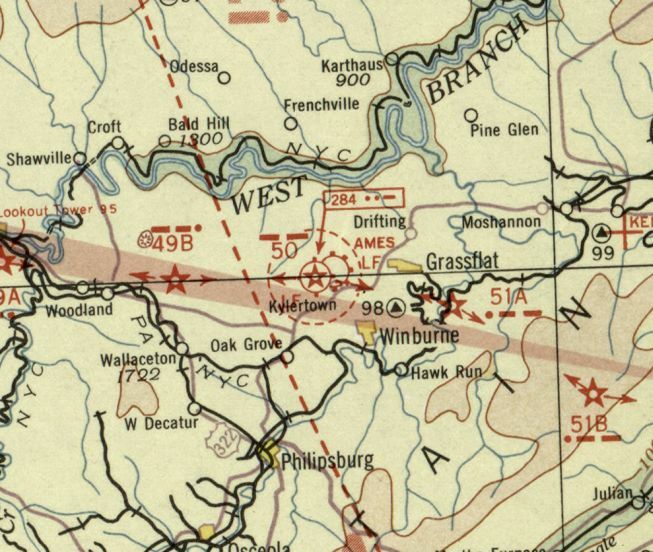 The last depiction which has been located of Hughesville Airport was on the January 1945 NY Sectional Chart. Hughesville's depiction had been downgraded to that of an auxiliary airfield. According to Wikipedia, “The years following World War II brought several changes in operation & the airport was soon abandoned. Very little use of the airport was made after the war. 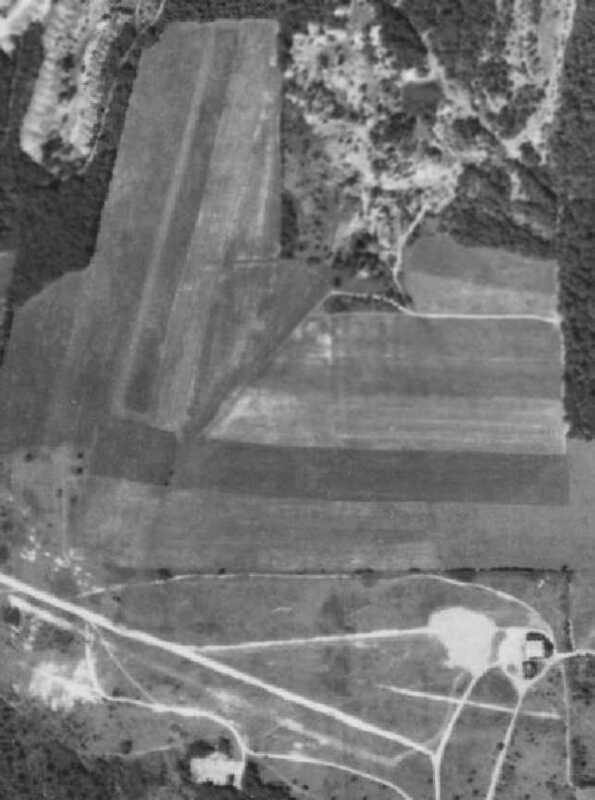 A 5/25/59 aerial view did not show any recognizable trace of Hughesville Airport. 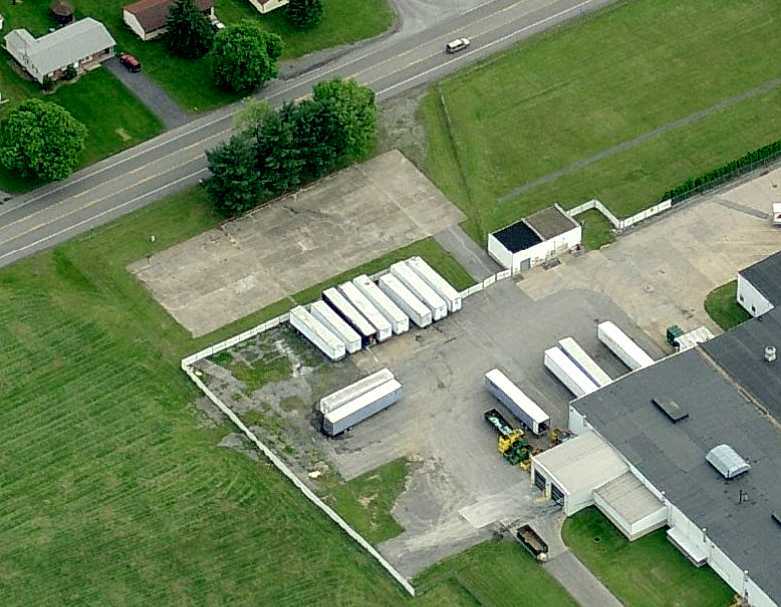 A 2016 aerial view looking north did not show any recognizable trace of Hughesville Airport. Thanks to Dennis Kepner for pointing out this airfield. A circa 1920s photo of a TravelAir 5000 in front of a hangar at Bellefonte Airport. “Before the U.S. Post Office Air Mail Service, little could be called scheduled air delivery. A few nonscheduled routes operated between major cities, but no national commitment existed for mail delivery by air. Then came the end of World War I, and the post office declared its intention to establish a cross-country airmail route. The Army Signal Corps offered to initiate the service. The Bellefonte Historical & Cultural Association continued, “Airmail pilots were the glamour boys of the operation. A breed apart, they were the envy of every kid in the nation who could look up & see a lonely biplane with 'U.S. Mail' painted on its fuselage winging its way across the sky. They were the by-the-seat-of-their-pants fliers, the helmet & goggle boys who felt the wind when they flew & heard it singing through the wires & drumming on the fabric of their wings. These earliest of the winged couriers flew as odd an assortment of planes as had ever been assembled. At one time or another the Air Mail Service tried more than 20 types, ranging from German Junkers to Curtiss 'Jenny' trainers & World War I bombers. The Bellefonte Historical & Cultural Association continued, “During the first years of Air Mail Service, the lessons came fast. Statistics tell the story. In 1921, P.O. officials recorded 1,764 forced landings, about half due to mechanical failures & half due to weather. In that same year, 12 pilots were killed. In all, 32 pilots lost their lives in the 9 years of service, approximately one 1 of every 6 employed. The Bellefonte Historical & Cultural Association continued, “From 1919-27 Bellefonte was a major refueling stop for mail traveling from NY to Chicago. was a feat of incredible daring & skill - 6 pilots would lose their lives flying what was popularly known as the 'Hell Stretch' between 1919-27. The initial stop on the first scheduled westbound air mail flight was made in Bellefonte by pilot Leon Smith on 12/18/18. was a circa 1920s photo of a high-wing monoplane (model unidentified) in front of a hangar. A circa 1920s photo of 3 de Havilland DH.4 biplanes next to the Bellefonte Airport hangar. A circa 1920s photo of a de Havilland DH.4 biplane next to the Bellefonte Airport hangar. A circa 1920s nighttime photo of a de Havilland DH.4 biplane inside the Bellefonte Airport hangar. 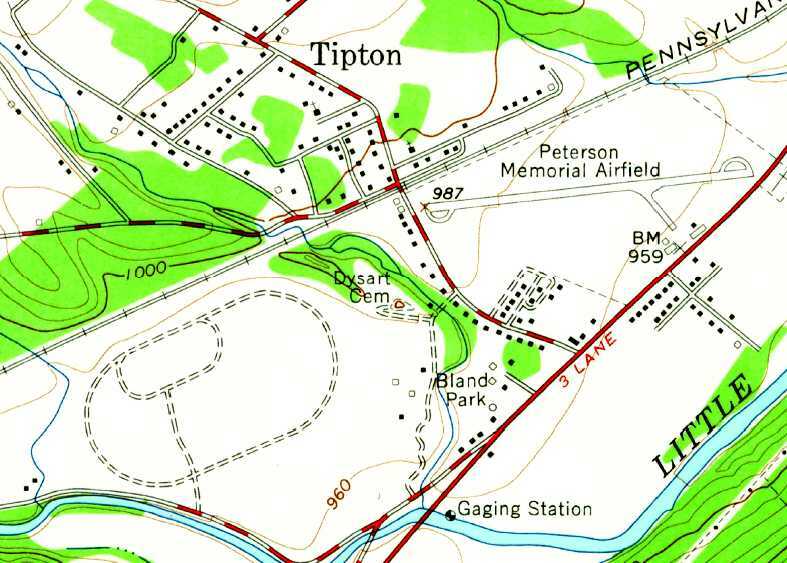 According to the Bellefonte Historical & Cultural Association, “The site for the field was in regular use for air mail until 1925. 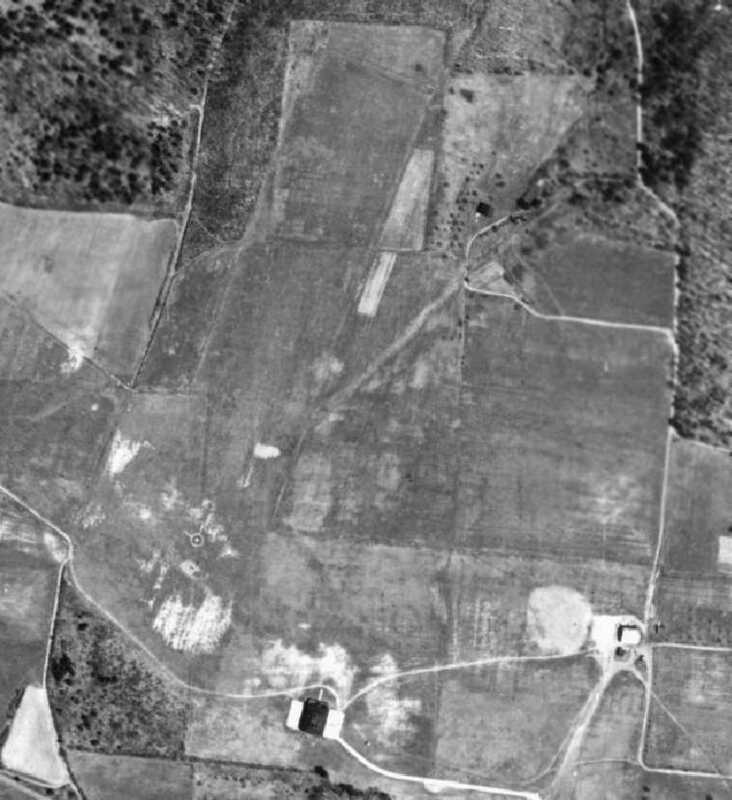 A 9/23/38 aerial photo showed no recognizable trace remaining of Bellefonte Airport. the American Philatelic Society celebrated the heroic era of the pioneer air mail pilots with the dedication of a monument in their honor. was the gift of Paul Mulvehill, a former pilot with a passion for air mail. 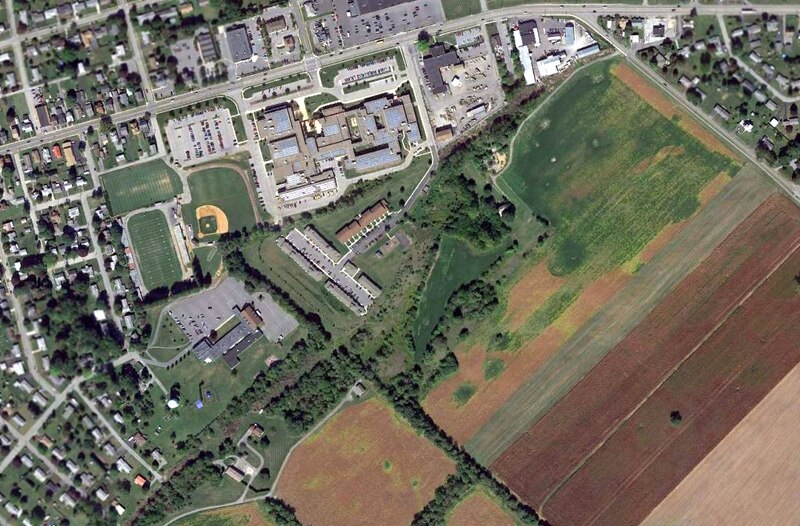 A 2015 aerial view showed no trace remaining of Bellefonte Airport, with the site covered by Bellefonte High School. The site of Bellefonte Airport is located south of the intersection of East Bishop Street & School Street. Thanks to Joe Guzzo for pointing out this airfield. 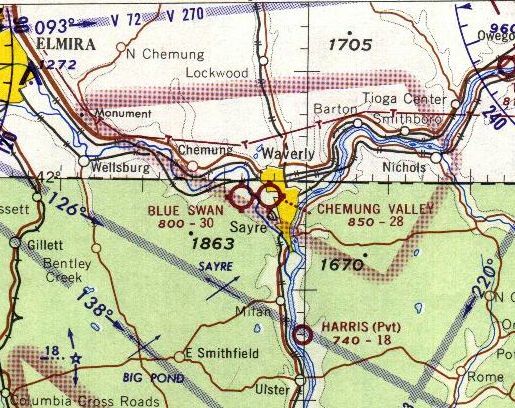 Blue Swan Airport, as depicted on the July 1949 NY Sectional Chart (courtesy of Ron Plante). as it was not yet depicted on the January 1945 NY Sectional Chart (courtesy of Ron Plante). was on the July 1949 NY Sectional Chart (courtesy of Ron Plante). It depicted Blue Swan Airport as having a 2,900' unpaved runway. John Neiley recalled, “Blue Swan Airport... the manager in the 1950s through the 1970s was Dana Smith. The Civil Air Patrol had a plane based there in the 1950s. and then get a free meal at O'Brien's Restaurant for the show they put on for its customers. 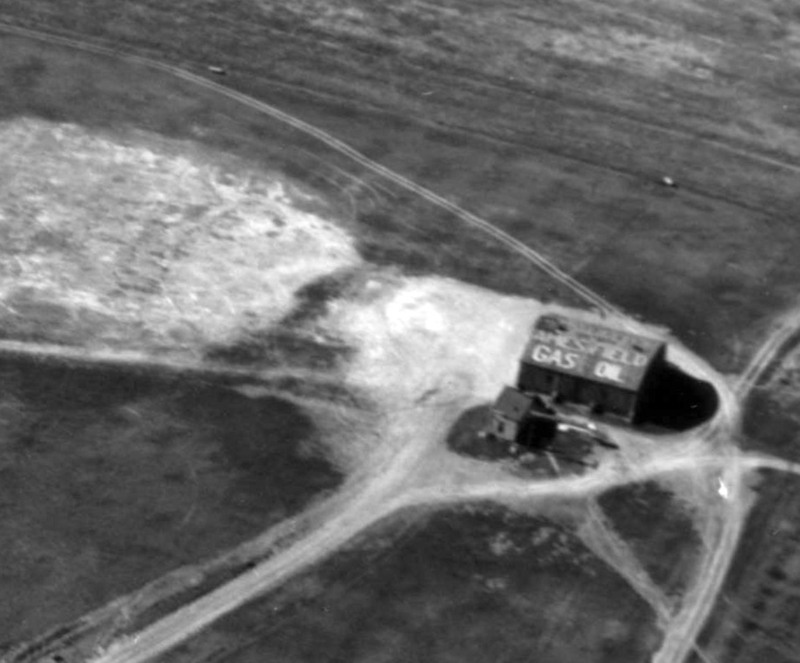 The earliest photo which has been located of Blue Swan Airport was a 5/16/60 USGS aerial view. It depicted Blue Swan as having a single unpaved east/west runway, with a few small buildings, T-hangars, and at least 2 light single-engine aircraft on the south side. The earliest aeronautical chart depiction which has been located of Blue Swan Airport was on the 1965 NY Sectional Chart. It depicted Blue Swan Airport as having a 3,000' unpaved runway. Brian Stoller recalled, “My dad kept his airplanes at Blue Swan from 1965-75 & we often flew most every weekend. The proprietors name was 'Dana' & I think the last name was Young. I remember that grass strip fondly. My dad learn to fly from the G.I. Bill after World War II & was a private pilot. with a dozen light single-engine aircraft on the south side of the field. on which 2 light single-engine aircraft were parked on the south side. 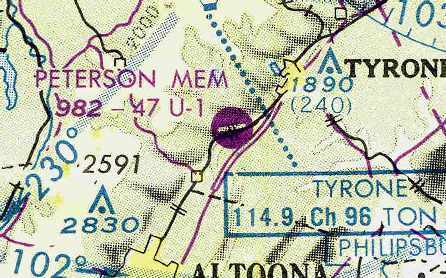 The last airport directory listing which has been located of Blue Swan Airport was in the 1997 PA Airport Directory (courtesy of John Clifford). The directory described Blue Swan as having a 2,850' turf Runway 10/28. It listed the licensee as the Borough of Sayre, the operator as Independent Aviation Inc., and the manager as Scott Jewell. Nathan Milarta reported in 2017, “The last time I remember any airplanes on the airport was in the early 2000s - only one small ultralight. There was a factory that was built behind Blue Swan and I think that killed off the airport. as a 2005 aerial view showed closed-runway “X” symbols on the runway. 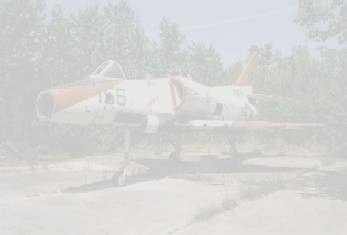 The hangars remained intact, but no aircraft were visible. A 2008 aerial photo showed 1 of Blue Swan's hangars had been removed at some point between 2006-2008. A circa 2010 aerial view looking south at the sole remaining hangar at the site of Blue Swan Airport. from the Borough of Sayre to use as the company's eastern regional headquarters. A 2011 aerial view showed the western hangar was the only one remaining, although the runway remained clear. A 2013 aerial view showed that all traces of Blue Swan Airport had been removed at some point between 2011-2013. 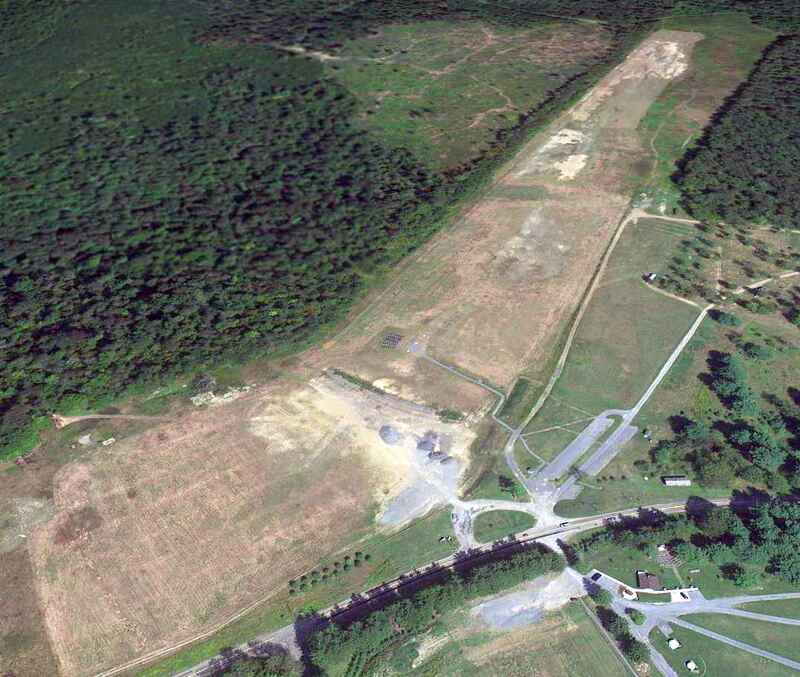 Yet another of the many small PA general aviation airports erased forever from the landscape. Nathan Milarta reported in 2017, “I currently work on the former Blue Swan Airport grounds. The site of Blue Swan Airport is located northeast of the intersection of Mile Lane Road & Lamoka Road. Thanks to John Clifford for pointing out this airfield. 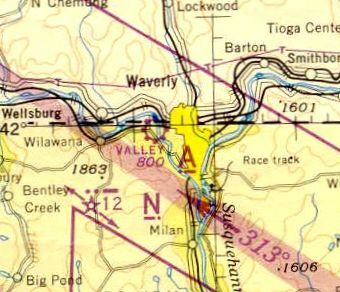 Valley Airport, as depicted on the 1945 NY Sectional Chart. as it was not yet depicted on a 1939 aerial photo. which depicted Valley as a commercial/municipal airport. as that is how it was labeled on on the July 1949 NY Sectional Chart (courtesy of Ron Plante). 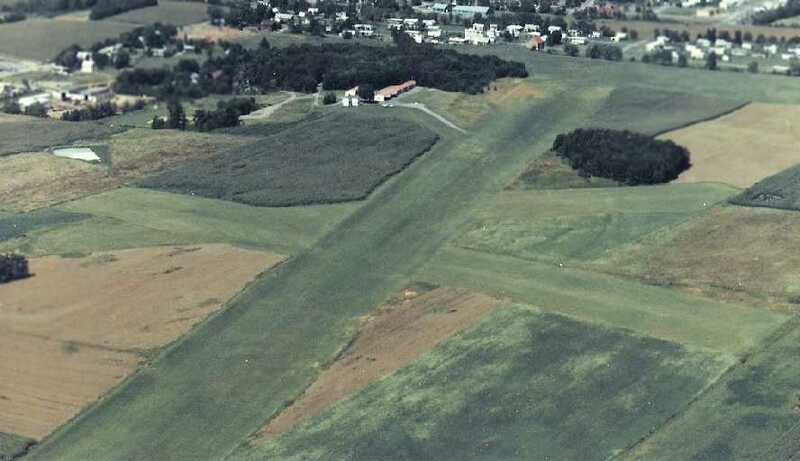 Chemung Valley Airport was depicted as having a 3,000' unpaved runway. 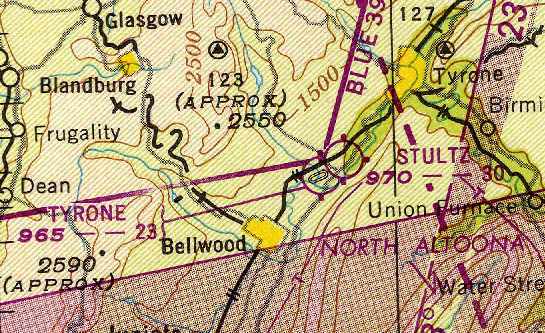 It was depicted as Valley Airport on the 1954 USGS topo map. Nathan Milarta reported, “My Great Uncle Don told me once he worked as an aircraft mechanic at Chemung Valley Airport. He was a aircraft mechanic in WW2, and shortly after the war he got his private pilots license. I have never heard the term Chemung Valley Airport. My Uncle used to call it Coles Airport. 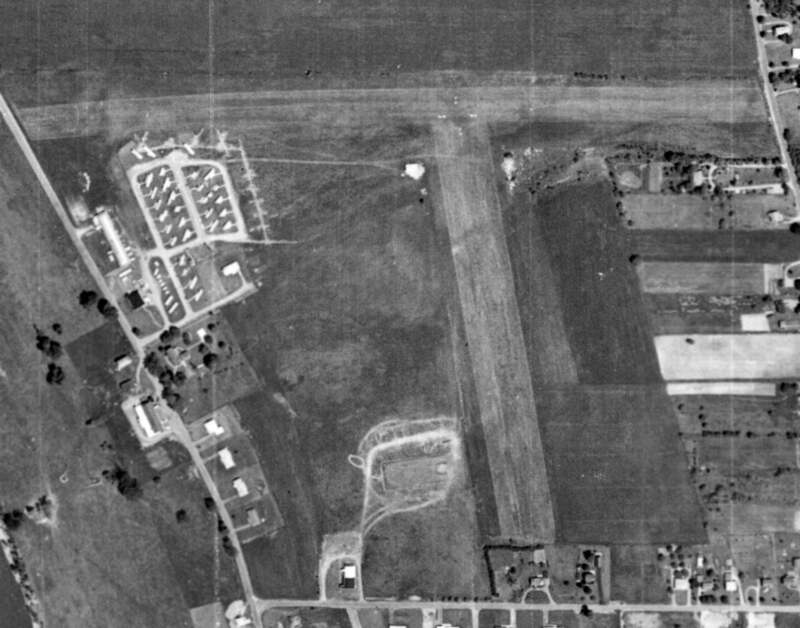 The earliest photo which has been located of Valley Airport was a 6/20/60 USGS aerial view. It depicted Valley Airport as having 2 unpaved runways. There were a few small buildings, but no aircraft visible on the field. 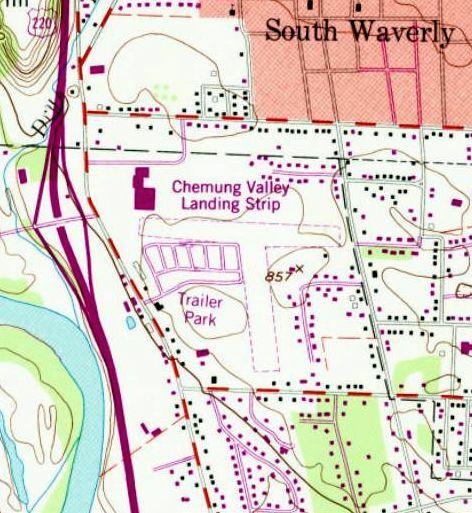 The 1965 NY Sectional Chart depicted Chemung Valley Airport as having a 2,800' unpaved runway. The 1969 USGS topo map depicted 2 unpaved runways, labeled simply as “Landing Strip”. 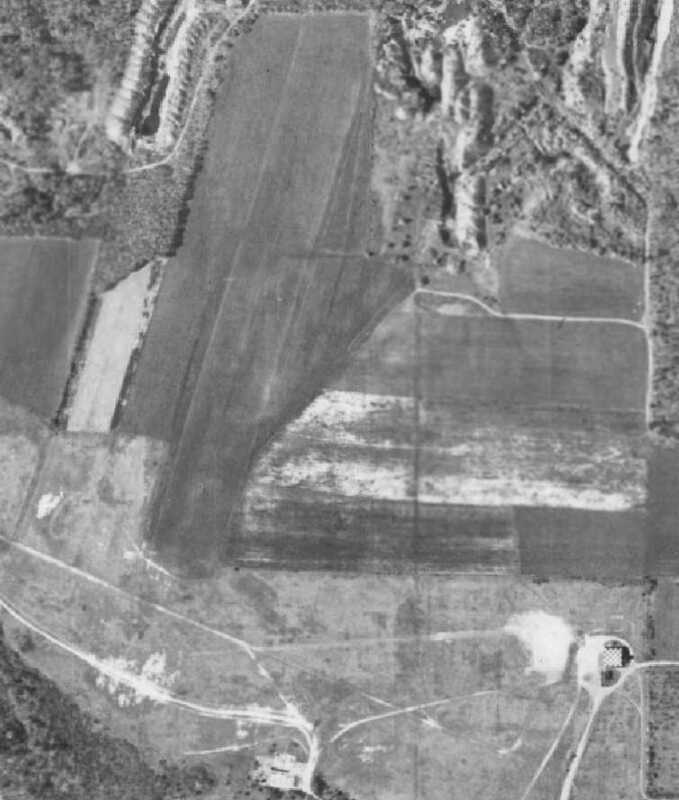 The last photo which has been located of Chemung Valley Airport was a 10/3/69 USGS aerial view. Although the 2 runways remained clear, there were no aircraft visible nor any other signs of recent aviation usage. 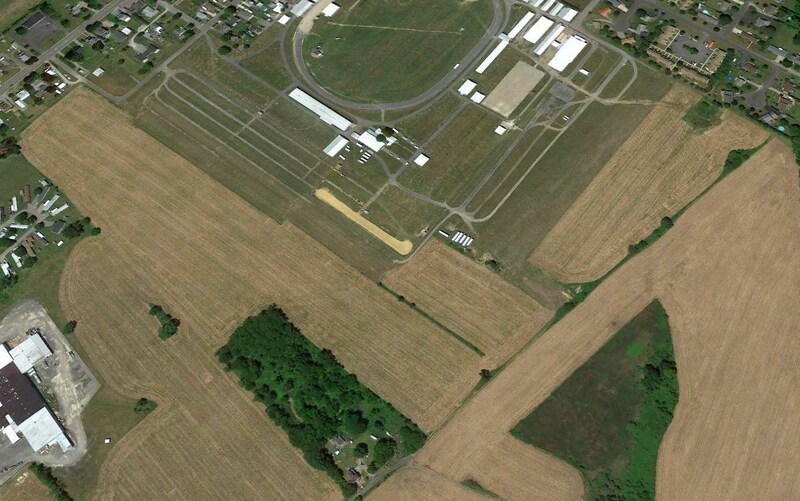 which depicted 2 unpaved runways labeled as “Chemung Valley Landing Strip”. 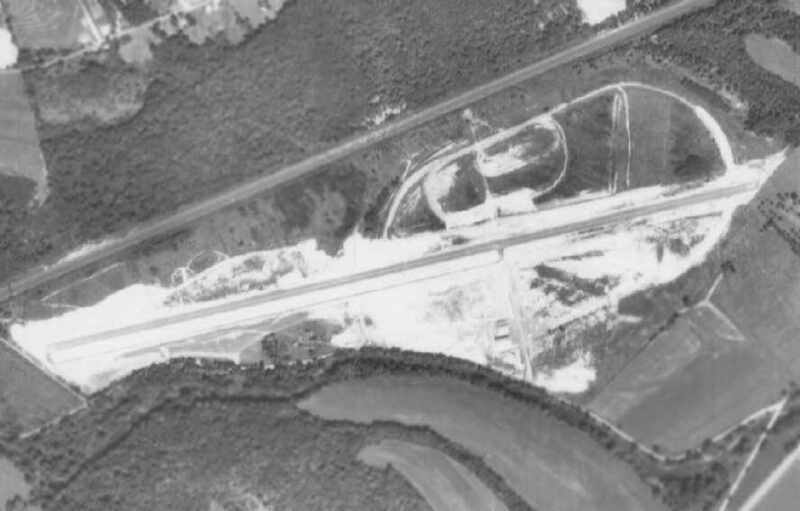 as a 1994 USGS aerial photo showed houses covering the site of both runways. 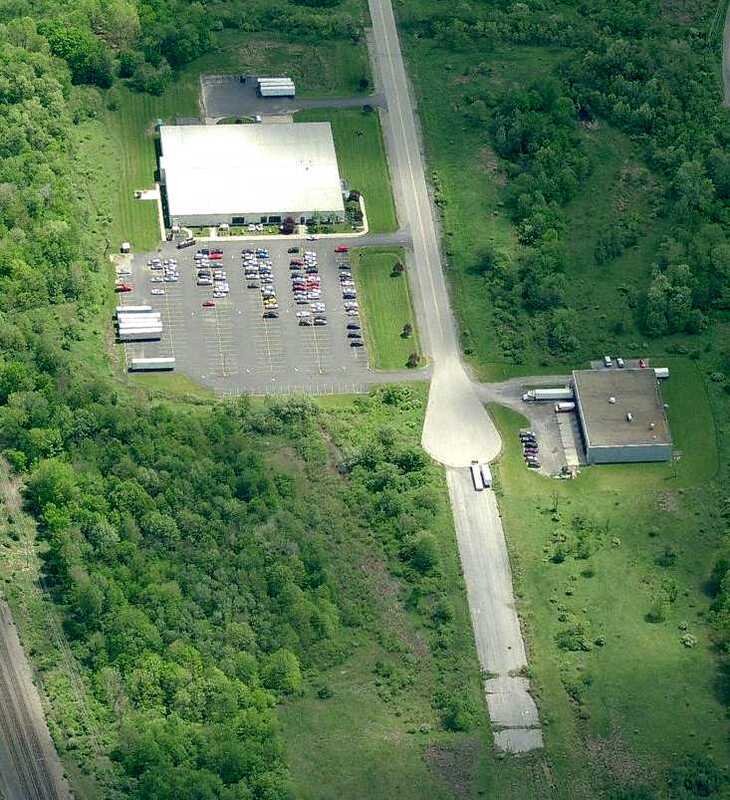 A 2013 aerial view showed houses covering the site of Chemung Valley Airport. Nathan Milarta reported in 2017, “Most people today have no idea there was an airport there. There is a K-Mart & trailer park there now at the former airport. 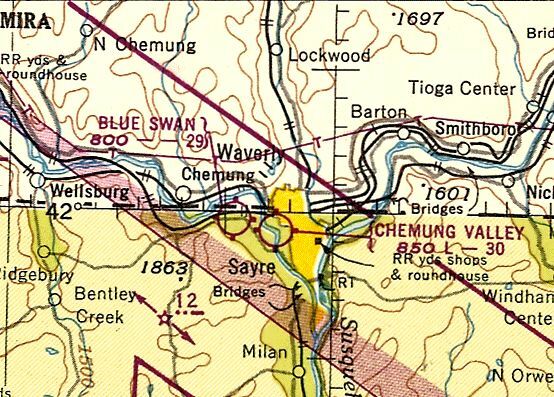 The site of Chemung Valley Airport is located at the intersection of Cessna Street & Piper Avenue, appropriately enough. Thanks to Aaron Weintraub for pointing out this airfield. A 5/11/37 aerial view looking southwest at Cherry Springs Airport (from the Dallin Aerial Survey Collection, courtesy of the Hagley Museum & Library). According to Wikipedia, Cherry Springs Intermediate Field was built for emergency landings in 1935 by the Pennsylvania Department of Forests & Waters as a 40-acre airfield. In 1936 Cherry Springs had a 2,400' sod runway & a hangar. 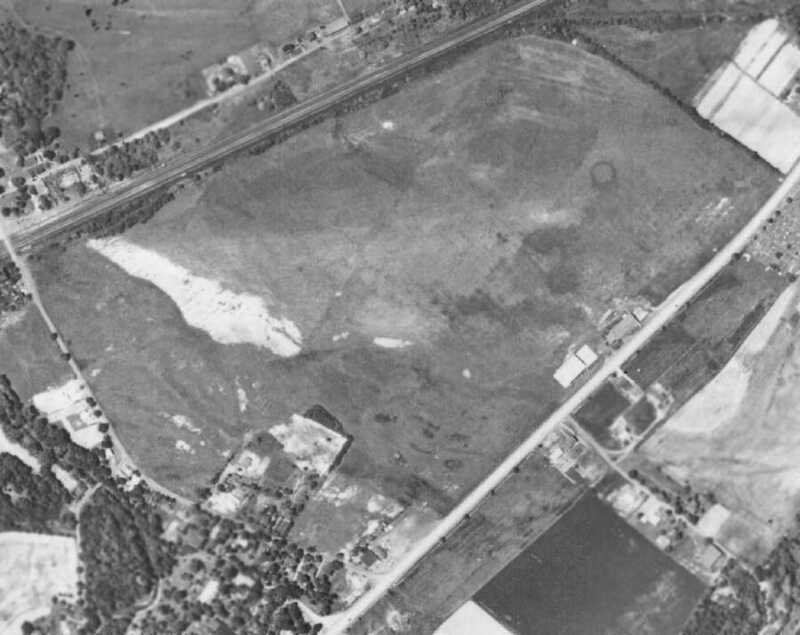 The earliest depiction which has been located of Cherry Springs Airport was a 5/10/36 aerial view (from the Dallin Aerial Survey Collection, courtesy of the Hagley Museum & Library). It depicted the field as having 2 unpaved runways, with a few small buildings on the southwest & northwest sides. 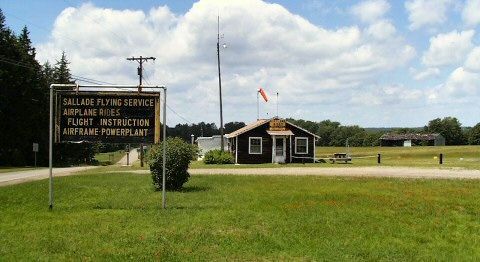 Cherry Springs was listed as a "State Emergency" airport in 1938, but eventually became a small general aviation airport. The land belonged to the Bureau of Forestry, while the airport was privately managed. 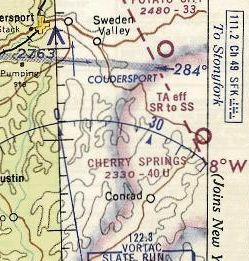 The earliest aeronautical chart depiction which has been located of Cherry Springs Airport was on the 1945 NY Sectional Chart. 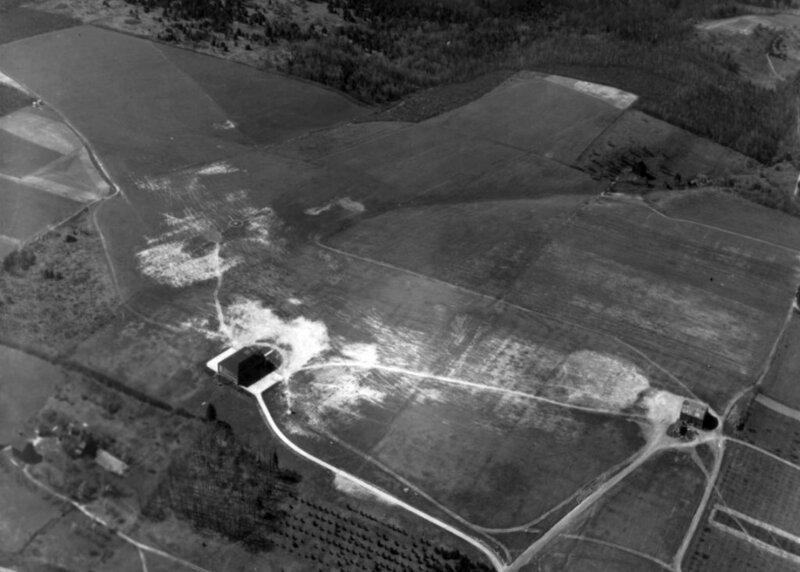 A 3/1/45 USGS aerial view depicted Cherry Springs Airport as having 2 unpaved runways, with a few small hangars on the northwest side. as having an unpaved east/west runway, with a few small hangars on the northwest side. 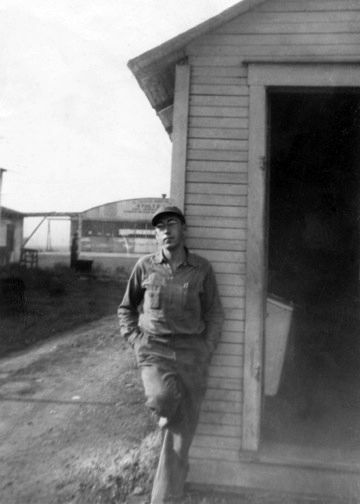 In 1948 Cherry Springs Airport was managed by Alfred Sallade & offered 80 octane fuel, flight training, sales, and taxi service. On 9/2/52, Cherry Springs Airport manager Alfred Sallade was arrested for fatally shooting Charles Van Pelt & seriously wounding Erwin Bergdoll. Both victims were walking in the park near the airport office when Sallade shot them with a shotgun. Sallade reported that he thought the victims were the people who had robbed his office twice in the recent past, but was convicted of manslaughter. Cherry Springs Airport was home to the Sallade Flying School in from 1964-90. 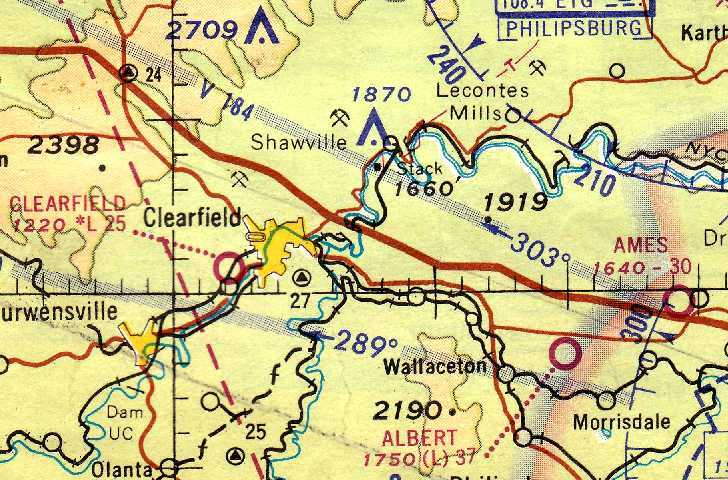 The last aeronautical chart depiction which has been located of Cherry Springs Airport was on the 1968 Cleveland Sectional Chart. It depicted Cherry Springs as having a 4,000' unpaved runway. In 1981 the airport had expanded from the original 40 acres to an area of 59 acres. A 2004 photo depicted the office of Sallade Flying Service at Cherry Springs Airport. In 2005 there were only 2 aircraft based at the airport, and local aircraft accounted for 50 of the total 150 takeoffs or landings that year. 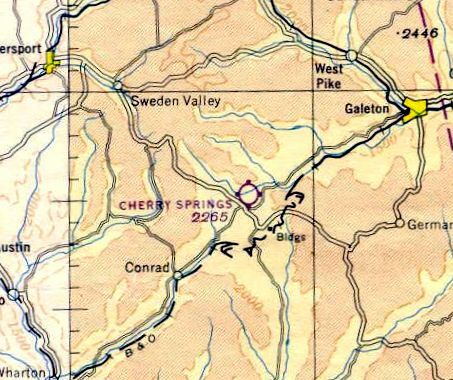 The last airport directory listing which has been located of Cherry Springs Airport was in the 2005 PA Airport Directory (courtesy of John Clifford). The directory described Cherry Springs as having a 3,570' turf Runway 10/28, and listed the manager as Al Sallade Jr. In 2006 the Cherry Springs Airport manager was Al Sallade, Jr. and it was home to Sallade Flying Service. The field had a 3,570' turf runway, marked with yellow cones & barrels. The airport had a hangar & tie downs available for aircraft storage, as well as wind direction indicator. "to expand the overall Dark Sky observation area & allow for increased programming opportunities", and the airport closed in 2007. The airport site had become popular with astronomers because of its dark skies, which make it one of the best places to stargaze in the eastern United States. As of 2009 all of the airport buildings had been razed. as well as raised earth berms to shield the stargazers from the headlights of passing cars. A 2009 photo looking east along Cherry Spring's former runway. 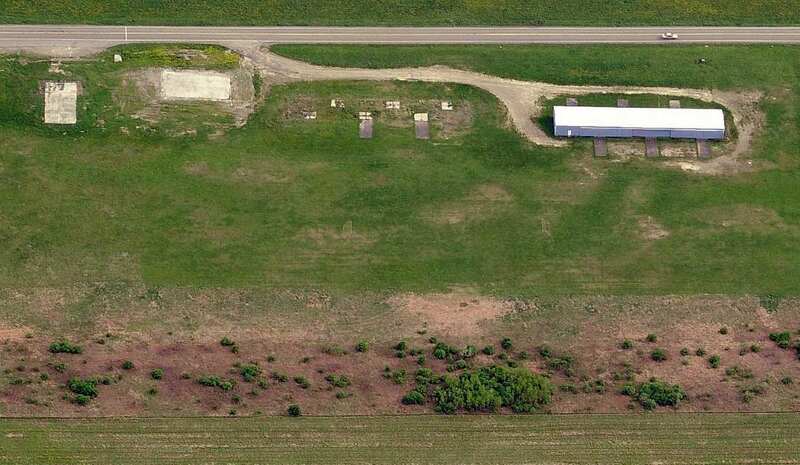 An 8/30/12 aerial view looking northeast at the site of Cherry Springs Airport. 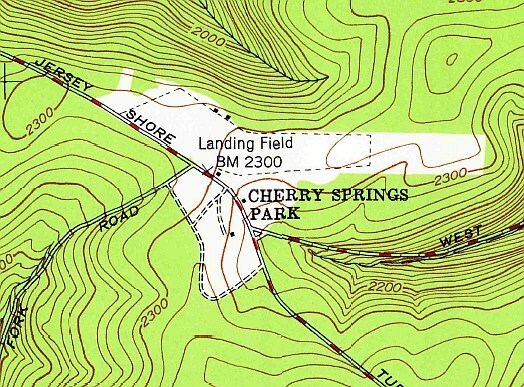 The site of Cherry Springs Airport is located northeast of the intersection of Route 44 & West Branch Road. Ames Airport, as depicted on the December 1932 Cleveland Sectional Chart. as it was not yet depicted on the 1922 USGS topo map. The earliest depiction which has been located of Ames Airport was on the December 1932 Cleveland Sectional Chart. It depicted Ames as a commercial/municipal airport, with the Commerce Department's Airway Beacon #50 located adjacent to the southwest. 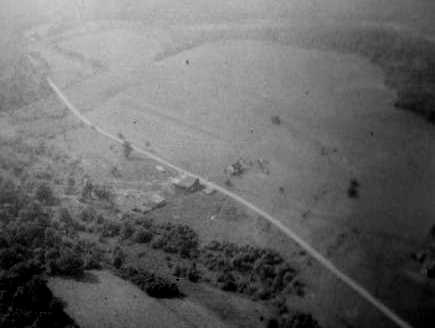 The earliest photo which has been located of Ames Airport was a 5/11/37 aerial view looking north. It depicted Ames as having 2 grass runways, with an airport circle marking in the intersection. One hangar was located on the southeast side, and another possible hangar was located on the south side. showing the hangar on the southeast side with “Ames Field Gas Oil” painted on its roof. A circa late 1930s photo of 4 Pipers in front of the Ames Field hangar & office (courtesy of Thomas Kirk). 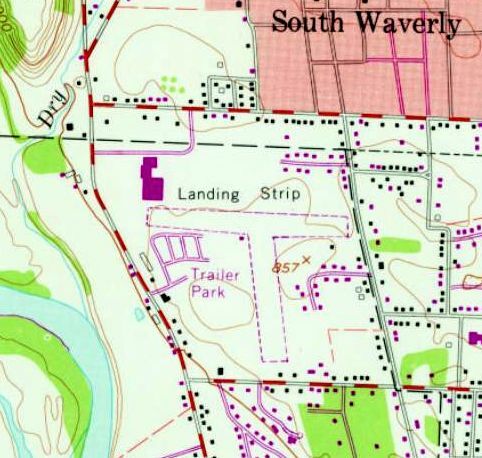 The 1939 USGS topo map depicted Ames Airport as having 2 runways adjacent to the northwest side of the town. A 5/9/40 aerial view (from Penn Pilot) depicted Ames as having 2 grass runways, with an airport circle marking in the intersection. and another possible hangar was located on the south side. 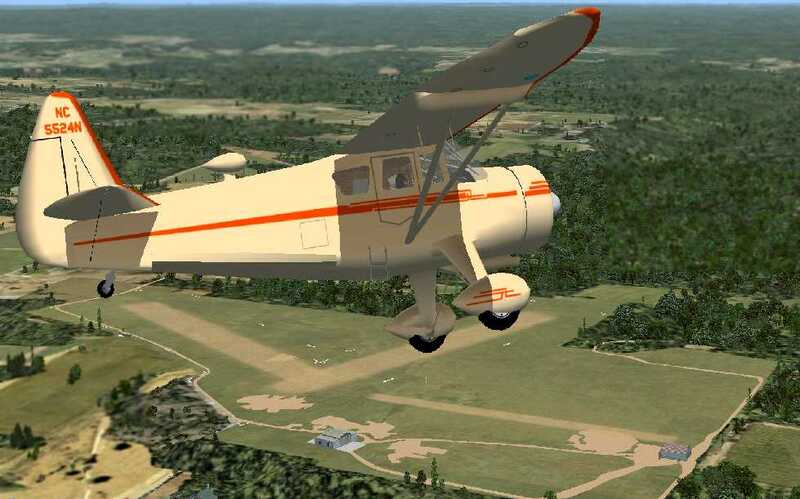 A flight simulation scenery re-creation of Ames Airport by Richard Finley, looking northwest at a Stinson Reliant overflying Ames Airport. had been replaced with an east/west runway on the east side. The checkerboard-roof hangar remained on the southeast side, but the possible hangar on the south side appeared to have been removed at some point between 1940-58. The last photo which has been located showing Ames Airport while open was an 8/21/68 aerial view (from Penn Pilot). but there was no indication of any recent aviation usage. as it was not depicted at all on the 1960 Cleveland Sectional Chart (courtesy of Mike Keefe). 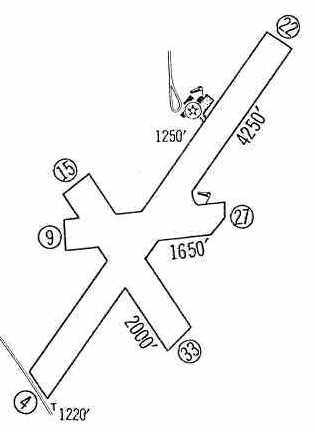 as it was once again depicted as an active airfield on the May 1968 Cleveland Sectional Chart (courtesy of Ron Plante). The last aeronautical chart depiction which has been located of Ames Airport was on the November 1968 Cleveland Sectional Chart (courtesy of Richard Finley). It depicted Ames as having a 3,000' unpaved runway. along with a survey marker named “Ames”. as it was no longer depicted on the 1981 USGS topo map. Only the survey marker on the southeast side of the property, named “Ames”, remained to give any clue as to the property's past. 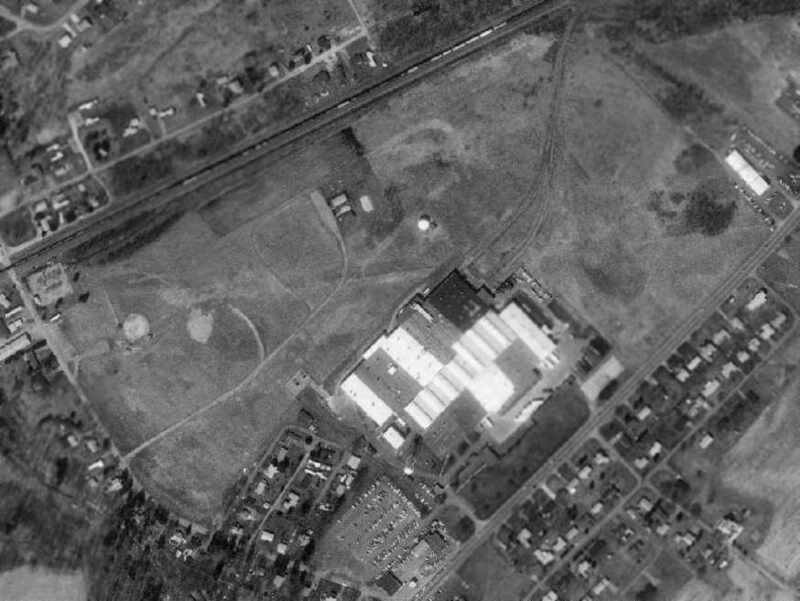 A 1993 USGS aerial photo showed that the hangar on the southeast side had been removed at some point between 1968-93. 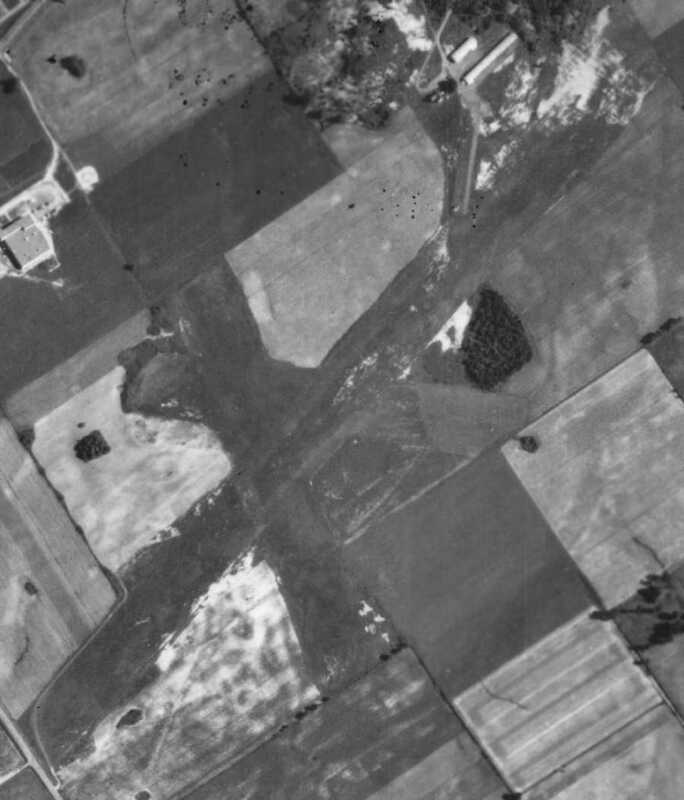 A 4/15/10 aerial view showed the outline of the 2 grass Ames runways remained clear more than 70 years after the airport's establishment. The site of Ames Airport is located at the western terminus of Kyler Lane. 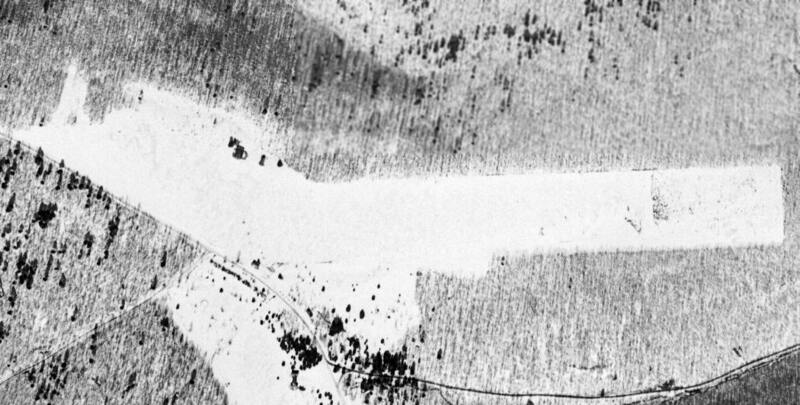 The earliest depiction which has been located of the Hyner Landing Field was a 10/2/1938 aerial photo. According to Bob Beck, “I found a local historian who provided some information about Hyner Flying Field. I was told it operated in the 1920's to 1930's & was used as an alternate mail route airport. 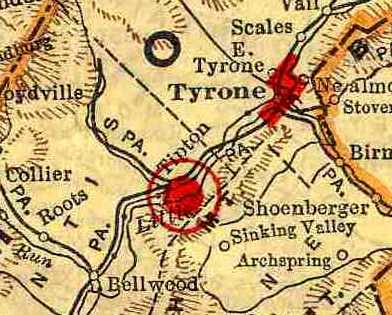 There were 2 airports (one in South Renovo, now the site of the Renovo Medical Center, and the one at Hyner). There was a flying club that administered both fields, led by Paul Maxwell. The field at Hyner had a T-hangar & clubhouse at the North end. the August 1938 NY Sectional Chart, or subsequent aeronautical charts(according to Chris Kennedy). along with the T-hangar at the north end. Hyner Field was not depicted among active airfields in the 1945 AAF Airfield Directory (courtesy of Scott Murdock). 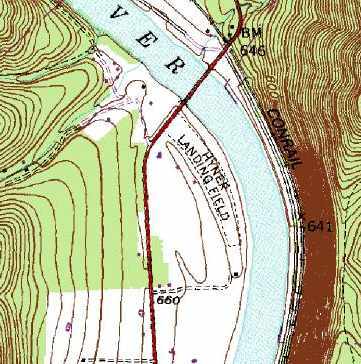 The earliest topo map depiction which has been located of the Hyner Landing Field was on the 1946 USGS topo map. 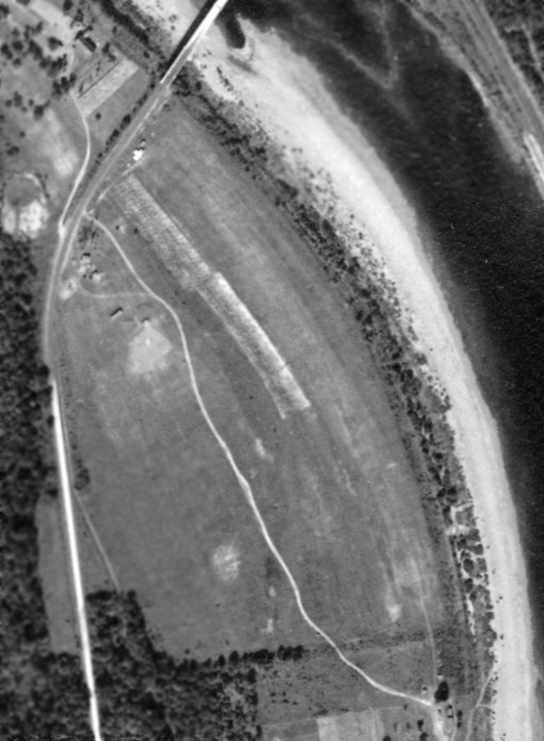 A 5/25/1959 aerial photo of Hyner Landing Field did not appear to show any evident signs of current use. with the T-hangar still visible. 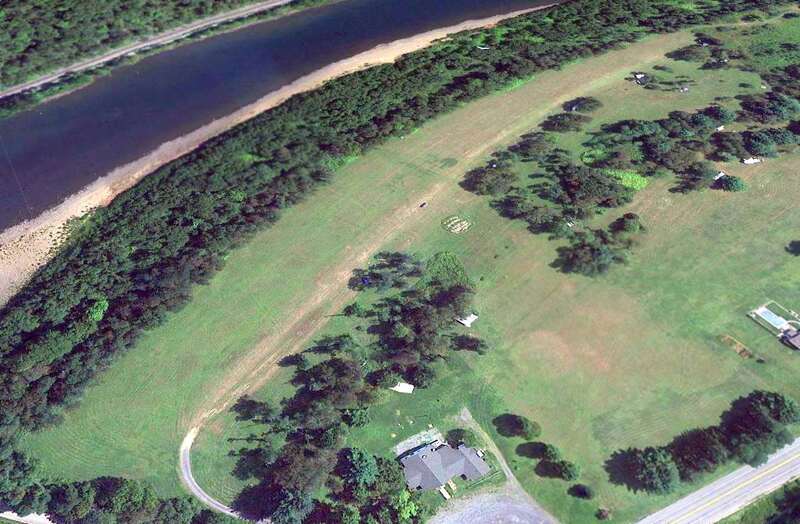 A 7/7/1968 aerial photo of Hyner Landing Field did not appear to show any evident signs of current use. which curves to follow the shoreline of the adjacent Susquehanna River. 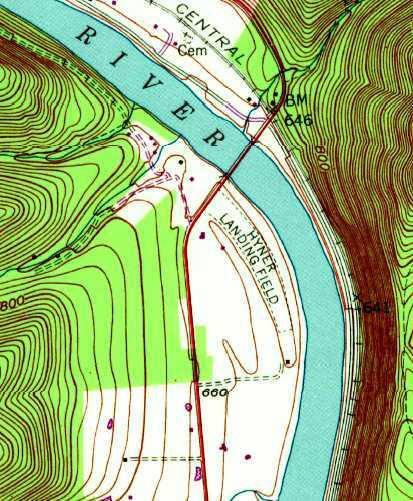 The only map depiction of Hyner Field which has been located was on the 1986 USGS topo map. 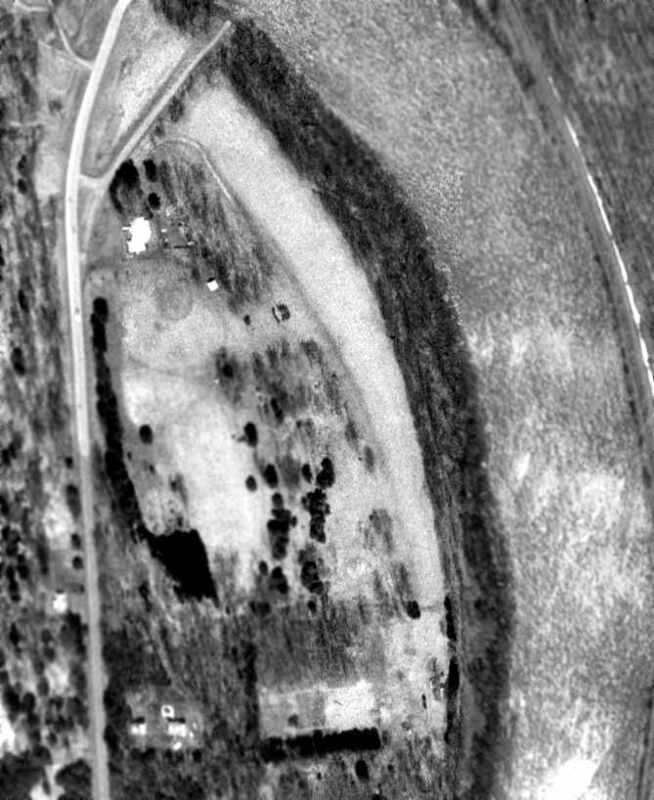 In the 1994 USGS aerial photo, the open area of the grass runway was still very recognizable. A 2005 aerial view by Bob Beck looking south at Hyner Field. A 2005 aerial view by Bob Beck looking southwest at Hyner Field. A 2005 photo by Bob Beck of “all that remains of the T-hangar & clubhouse. This is the tail section of the Tee & the back wall of the left wing section. The roof & walls are there but are settling into the ground with grass/weeds already growing on the remains. A 2012 aerial view looking southeast at the Hyner Field runway. Hyner Field is located on the east side of Route 120, just south of the Susquehanna River. "Stultz Field", as depicted in the 1929 Rand McNally "Standard Indexed Map With Air Trails" (courtesy of Chris Kennedy). operated by Wilmer Stultz - Amelia Earhart's pilot on her Trans Atlantic passenger flight/ride." The date of construction of Stultz Field has not been determined. was in the 1929 Rand McNally "Standard Indexed Map With Air Trails" (courtesy of Chris Kennedy). measuring 2,000' x 1,400', and having a beacon light. and a hangar was said to have "Altoona-Tyrone" painted on the roof. 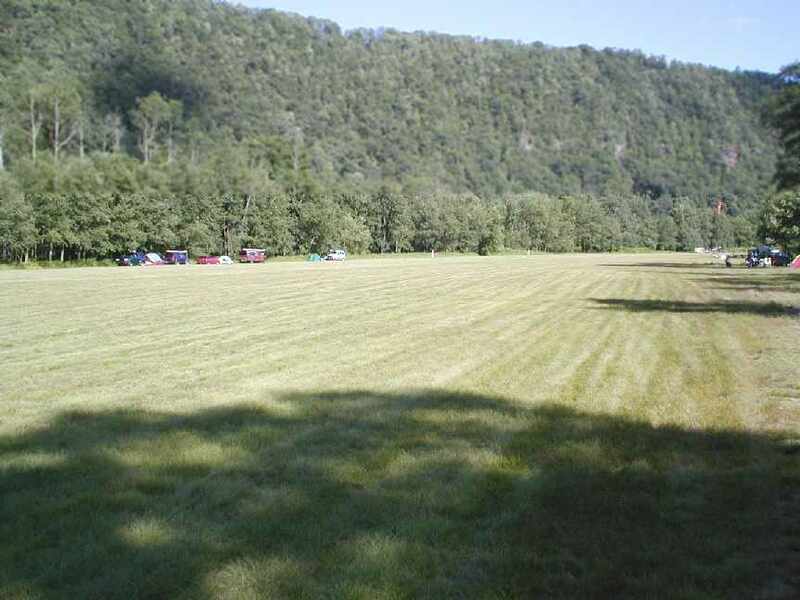 described Stultz Field as having a 2,140' x 1,100' "Entire field available" landing area. with a single hangar on the southeast side, near which were visible 2 light aircraft. 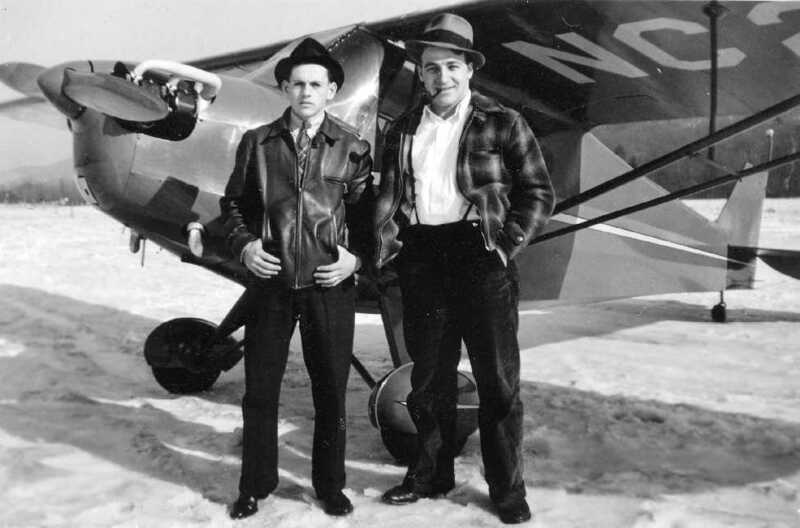 A 1939 photo of Bill Slemmer Sr. & Joe Galloway in front of a Piper J-4A Cub Coupe with a Continental A65 engine at Stultz Field (courtesy of Bill Slemmer Jr.). 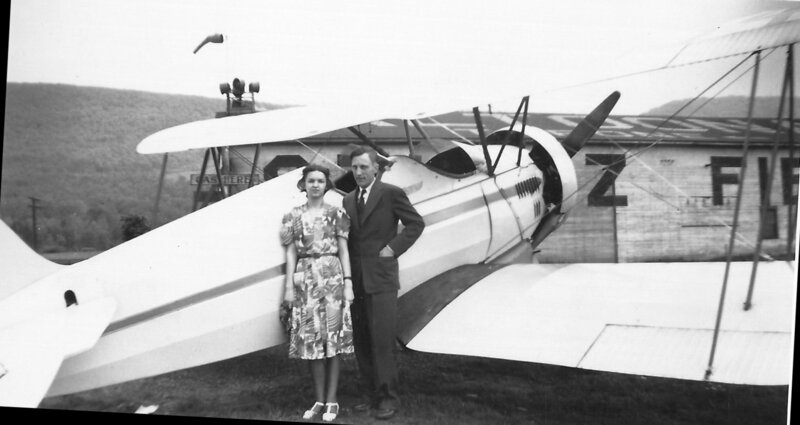 A 5/29/39 photo of an unidentified couple in front of a 1933 Waco UBF2, with a hangar in the background on which is marked "Altoona", "Tyrone", and "Stultz Field" (courtesy of Brian Miller). A 5/29/39 photo of an unidentified man with a 1933 Waco UBF2 at Stultz Field (courtesy of Brian Miller). Brian Miller reported, “The plane was bought brand new from the Waco plant in Troy, OH in 1933 to ferry passengers back & forth from Pinehurst, NC. was on the March 1940 Cleveland Sectional Chart (courtesy of Richard Finley). as a 95 acre rectangular property within which was a sod all-way landing field, measuring 2,300' ENE/WSW by 1,800' Nne/SSW. A 1948 photo of Clair Rutter with the Stultz Field hangar in the background (courtesy of Mark Rutter). depicted Stultz Field as having a 3,000' unpaved runway. A 1950 aerial view by Don Struke looking west at Stultz Field. A 1950 photo by Marian Wills (courtesy of Don Struke) of a Grumman Goose at Stultz Field. Don noted, “On the nose it says 'British American Oil Company Limited, Toronto, Canada'. A 1950 photo by Marian Wills (courtesy of Don Struke) of Jerry Struke pretending to climb in a Fairchild PT-19 at Stultz Field. 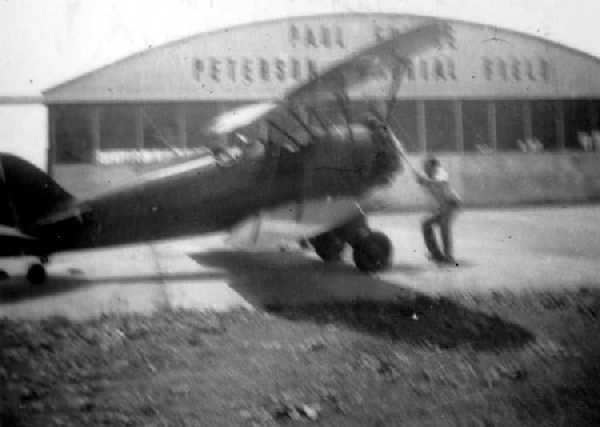 Paul Peterson Jr, the son of the owner of Stultz Field, was killed at the airport on 3/18/51 while hand-propping a Waco. The airfield was renamed Peterson Memorial in his honor. Don Struke, “Paul Peterson was 21 when he was killed & I think he slipped on frozen ground or ice while propping the Waco. in front of the hangar which had been newly painted with the field's new name of “Paul Peterson Memorial Field”. rode our bikes approximately 15 miles on a bright sunny Sunday morning from Altoona to the Peterson Memorial Field. Our plan was to take a ride in a Piper Cub or Cessna just around the Altoona, Bellwood area. We had a total of $13 between the two of us. When we arrived at the field there was only one person in the hangar office being Mr. Peterson, himself. He asked us what we wanted & we asked if there was any chance of taking a ride in a plane. He didn’t hesitate, asking us immediately how much money we had, taking our $13 & telling us to go get in a Cessna that was sitting out in the open area. We didn’t know it but we were on our way over the Allegheny mountain ridges to Cumberland, MD. When we landed & got out of the plane with Mr. Peterson, we could tell he was very well-known by everyone that was there attending a fly-in breakfast. He treated us to breakfast & got us back to Central PA by 2 in the afternoon. 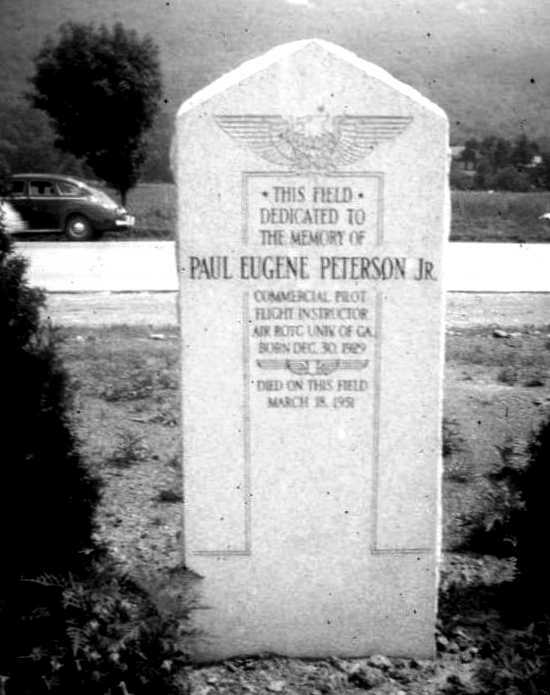 A 7/13/52 photo by Don Struke of the memorial at Peterson Field to Paul Peterson Jr. 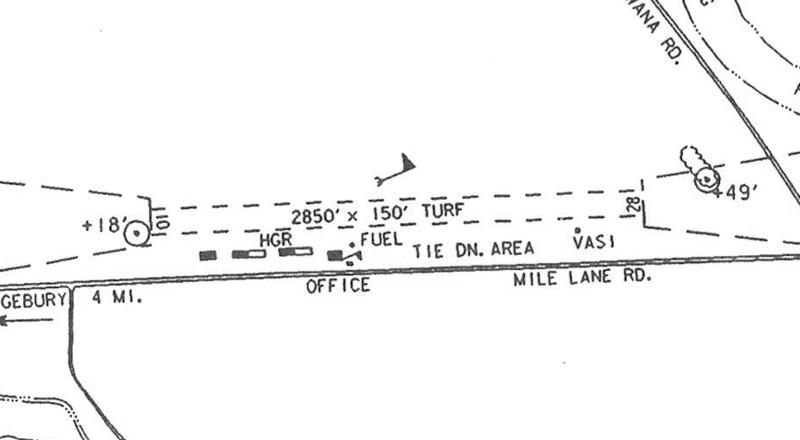 The 1953 Cleveland Sectional Chart depicted Peterson as a commercial airport with a 2,500' unpaved runway. with the longest being the 2,700' east/west strip. and the manager was listed as Paul Peterson. John Hockenbury recalled, "I had my first ride at age 6 in a Super Cruiser out of the old Tipton airport. It was a grass strip then, but pretty active." showed the field to consist of an open grass area, with several hangars along the southeast side. as having a 2,500' unpaved runway. 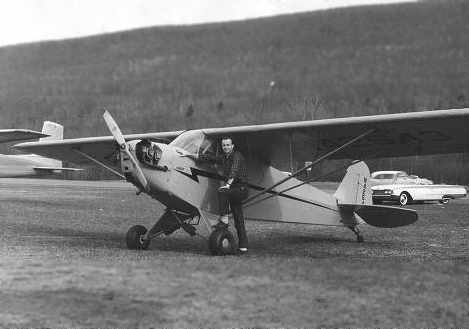 A 1961 photo of Don Struke in front of his Piper Cub at Stultz Field. Since I first sent the J-3 picture, I found my first log book, and its first two pages are attached in the second photo. I think the fourth instructor signature is Paul Peterson Senior's. What's more, I ran my 1968 Corvette (an SCCA big block A Production race car) on the Peterson drag strip, probably around 1972. Don Struke recalled of Stultz Field: “The grass strip where I learned to fly in the 1960s. It was named for Wilmer Stultz. but he worked in the Pennsylvania Railroad shops in Altoona. where a friend managed to land after forgetting to pull on carb heat & he tried to go around. Bad idea. and one nice day a USAF student on a cross-country thought he'd drop in - unofficially - to say 'hi' to his folks. the neophyte aeronaut done in by the rolling nature of the terrain. and a wrecked BT-13 was perpetually parked beside one of the buildings. and we found some old Wilmer Stultz-era sheepskin lined leather flying suits. and come wandering out of the night into the terminal lights, dragging 2 opened chutes like a couple of Twilight Zone wanderers. described Peterson Memorial as having a single 2,700' sod Runway 9/27. with a taxiway leading to a ramp on the southeast side of the field with a few small buildings. The manager was listed as Paul Peterson. was on the May 1965 Cleveland Sectional Chart (courtesy of Chris Kennedy. It depicted Peterson Memorial as having a single 3,000' paved runway. 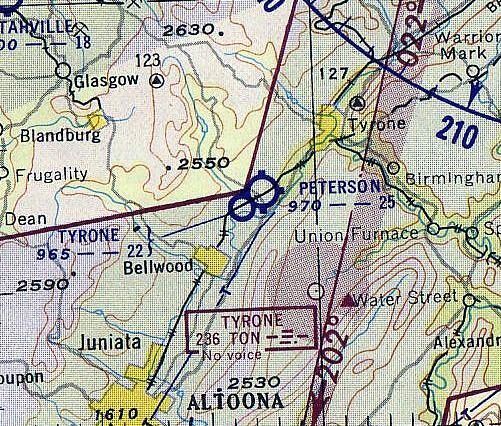 and a new Peterson Memorial Airfield was constructed on the site of Tyrone Airport, just across Clearfield Avenue to the west. Only the new Peterson Memorial Airfield was listed among active airfields in the 1967 AOPA Airpor Directory (according to Chris Kennedy). Scott Stevens recalled that the site of the original Peterson Airfield “has been the site of a PPG factory since I was a little kid, before 1965.
along with at least some of the former airport buildings (on the southeast side of the field). running east/west just north of the PPG plant which took over the southern portion of the airport site. as the factory occupies their former location. in the dark-colored stand of trees in in between the road & the light-colored rectangle just east of the factory. A circa 2007 aerial view looking south at the concrete floor of the former Peterson Memorial Airport hangar. Michael Eye reported in 2009, “I grew up across the road from the PPG building which occupies the former Stultz field site. 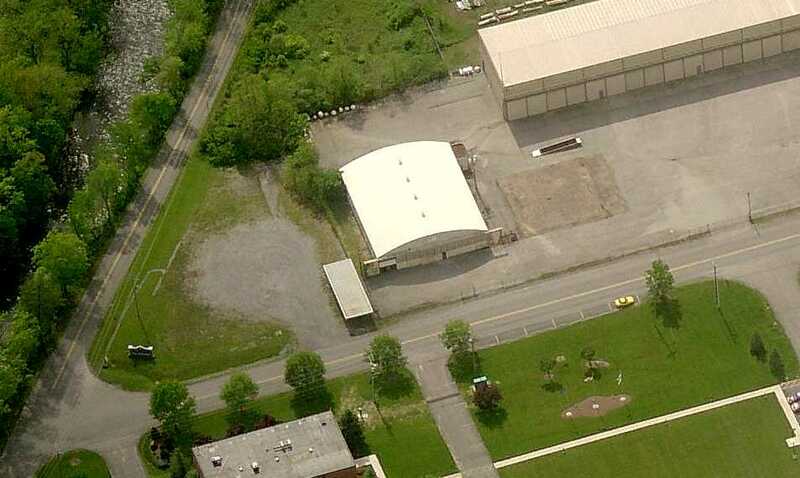 The original hangar floor, directly beside Route 220 was a area to play basketball provided by the PPG Corporation. The site of the original Peterson Memorial Airfield is located east of the intersection of Clearfield Avenue & Spruce Street. 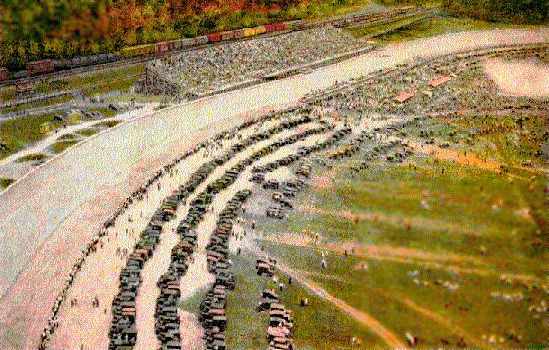 A circa 1923-29 aerial photo from a postcard depicting the Altoona Speedway. before finally becoming an industrial park. was the location of the Altoona Speedway starting in 1923. The track was made of yellow pine 2x4's laid up on edge. It was 60 feet wide & 1.25 miles long. A total of 3 racers lost their lives during the speedway's existence. The highest speed ever recorded there was 139 mph by Leon Duray, on a test run in 1926. The Altoona Speedway operated until it was forced to close in 1929, with the start of the Depression. 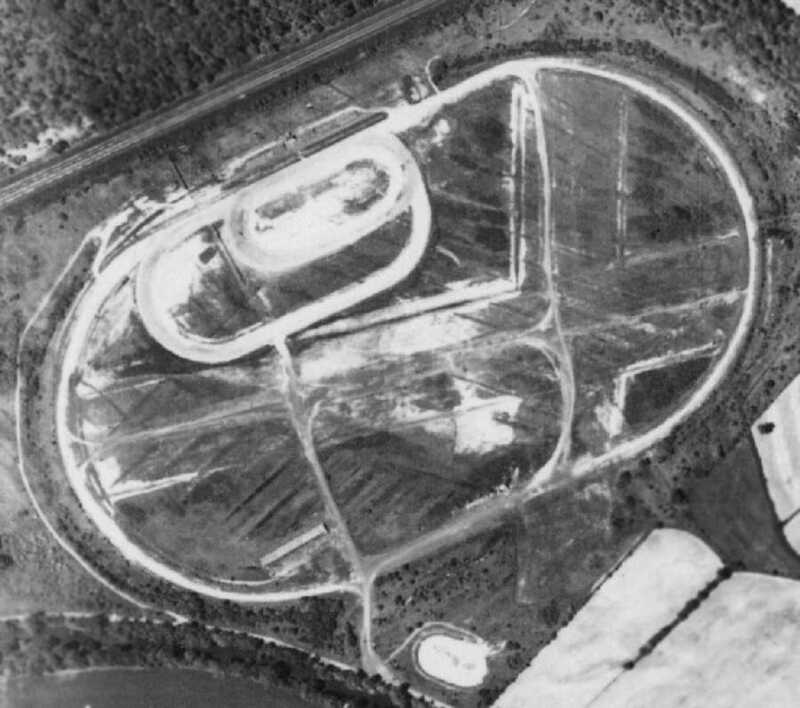 An 11/11/38 aerial view did not yet depict any recognizable aviation use of the Altoona Speedway property. Tyone Airport was established on the site of the abandoned speedway at some point between 1941-49.
was on the January 1949 Cleveland Sectional Chart (courtesy of Chris Kennedy). and described the field as having a 2,300' unpaved runway (which could have fit within the center of the racetrack). 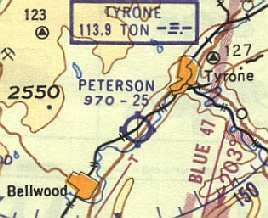 The 1953 Cleveland Sectional Chart depicted Tyrone Airport as having a 2,200' unpaved runway. was on the January 1955 Cleveland Sectional Chart (according to Chris Kennedy). as it was no longer depicted at all on the December 1955 Cleveland Sectional Chart (according to Chris Kennedy). showed the outline of 2 former grass runways along with the oval outline of the former racetrack. Note that the north/south runway appeared to extend beyond the outline of the racetrack to the south. It is not known if the building on the southwest corner of the site was related to the airport or the racetrack. 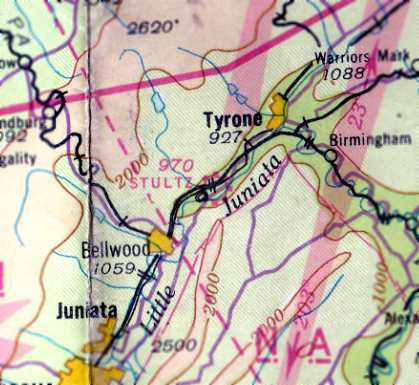 The 1963 USGS topo map no longer depicted the former Tyrone Airfield, just the racetrack oval. 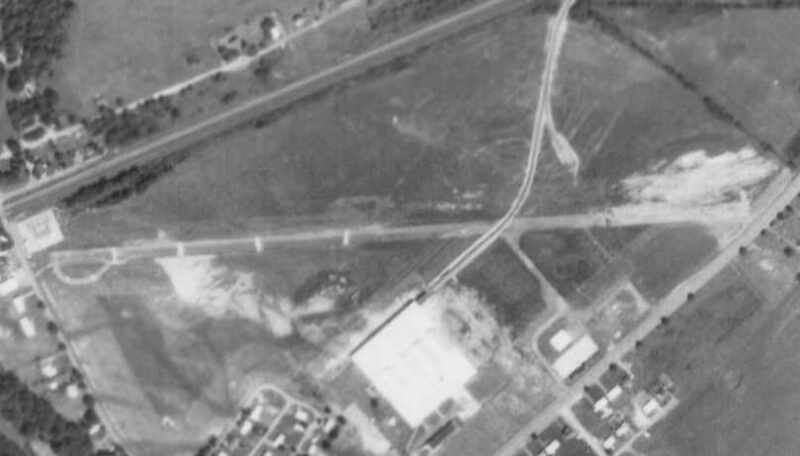 replacing the original Peterson Airfield just across Clearfield Avenue to the east. was in the 1967 AOPA Airport Directory (according to Chris Kennedy). It described Peterson as having a single 5,000' bituminous Runway 8/26. with a hangar on the south side of the property. 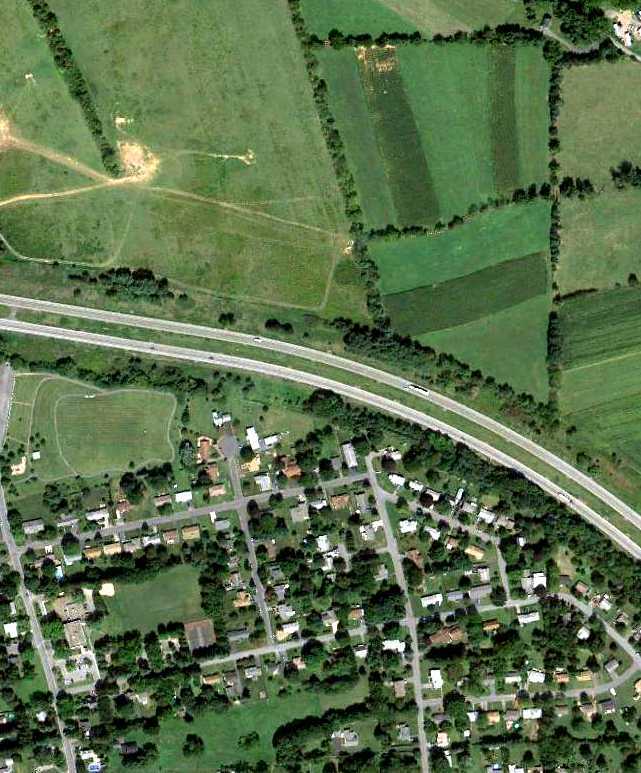 Note the oval outline which remained of the 1920s-era Altoona Speedway. right on top of the symbol for the oval racetrack. described Peterson as having a 5,000' runway. and may have had cones on potholes. Paul Peterson was a CHARACTER. I listened to his stories for an afternoon. He claimed to know, and/or taught to fly, many famous people. left me dazed while I attempted judge the validity & listen. My recollection is that Goldwater, JFK, Mike Todd, etc were mentioned - it was an interesting afternoon. [who] died from a prop strike while propping a Waco UPF-7." Richard Finley recalled, “I met Paul Peterson in 1970. He was indeed a character. He told me he was one of the first airline pilots. He told me about his son. He told me how he ran the drag strip himself. He said some people took advantage of hes hearing loss. Richard continued, “Yes there were cones near the east end of the runway. Here is the story of those cones: I landed there to visit a friend who lived in Bellwood, PA in 1970. There was a Navy S-2 Tracker parked beside the taxiway leading to the main ramp. It was listing to one side. The next time I went in there, I mentioned it to Mr. Peterson. He said a local man had become a Navy pilot & wanted to fly one of the squadron planes back to visit his family. Mr. Peterson said he told the gentleman not to land at Peterson Memorial because the pavement was not built to handle the weight of an S-2. The guy landed there anyway. On landing, they blew one of the tires. Mr. Peterson told them not to bring the parts and repair crew in on another S-2 but they did anyway. Peterson told them to fix their airplane then get out & don"t come back. They fixed the flat & the first plane departed. When the second tried to spin around in position at the end of the runway, his right main broke through the pavement and sunk into the earth below. They had to jack it up to get it out of there. OK, now he has a damaged runway. How do you fix it? Mr. Peterson painted a displaced threshold on the runway. He put up some cones & stuck a short pole with a flag on it in the hole. Richard continued, “I landed there in my Cessna 150. I asked that the airplane be serviced while I was gone. and had been replaced temporarily by a slotted Dzus fastener with no retainer. I warned him to be sure that one was properly seated. My wife & I spent the day visiting & planned to depart after dark. That was somewhat problematic since Peterson Memorial was not lighted. I did a quick preflight & bid Mr. Peterson a good evening. We departed from the dark runway with no problem. Upon takeoff, we encountered a problem less than a mile from the field. There was a snap sound followed by a very loud 'ratta-ratta-ratta' sound that would rise, ebb then rise again. This process kept repeating itself. Richard continued, “Peterson Memorial was unlighted. It was located in the floor of a deep valley. There was a large water tower very close to centerline about a quarter mile from the approach end of the runway. There were obstacles on the pavement at the approach end of the runway. Making an night approach/landing into an airport like that is not a safe thing to do. and not knowing for sure what the problem was was not very safe either. I decided to try a landing. On the downwind to the west runway, there was an obstruction light at the top of the mountain where a road crested the hill. It was a good place to turn base. I flew toward that obstruction light but kept it off my right. and descended so as to pass the water tower at an altitude slightly above the water tower and with the tower just off my right. I turned on my landing light & soon had the end of the runway in sight. Richard continued, “My landing was successful & Mr. Peterson was still there. I went in to complain about what his lineman had done. He & I went out into his hangar. He emptied out a coffee can full of junk/spare hardware. We found a Dzus fastener like the one I had been using. Mr. Peterson never apologized for what his employee had done & he charged me fifty cents for the fastener. I never met him again after that. He was a man with many rough characteristics. with a taxiway leading to a ramp on the south side of the field, with 3 buildings. The field was also described as conducting drag racing. According to Tom Beamer, the 1974 PA Aeronautical Chart depicted it as P.E. Peterson Memorial. as having a single 4,800' hard-surface runway 8/26. but that drag racing was conducted on Sundays. Jim Hackman recalled, “In mid 1975-76, we landed at Peterson Field in a Citation 500. Probably the only jet to land there & there was no one around to witness. Back in 1973-74 we landed at a lot of places that had never hosted a jet! We landed there because that's where the Traffic Department scheduled us. It was a nice morning & the copilot made a good landing. Just as he shoved the [thrust] reversers we went past a sign along the side of the runway. It said 'No aircraft beyond this point'. We turned around on the drag strip portion & taxied in. There was nobody there; it was deserted. We called over to Altoona Blair County [Airport] & located our passengers. was on the December 1976 CF-18 World Aeronautical Chart (courtesy of Chris Kennedy). 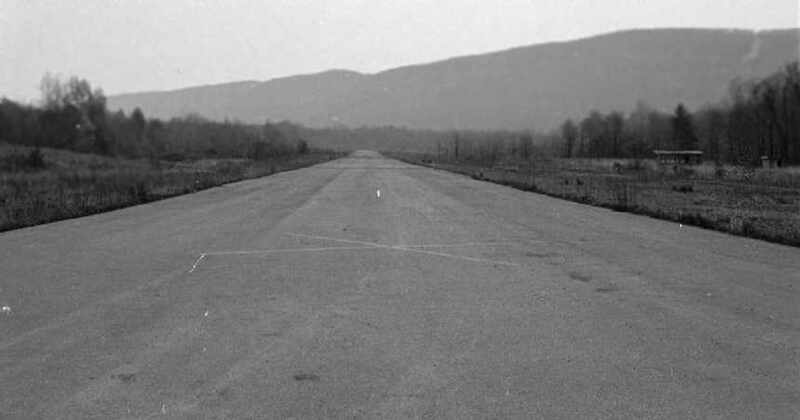 It depicted Peterson as having a single 4,700' paved runway. 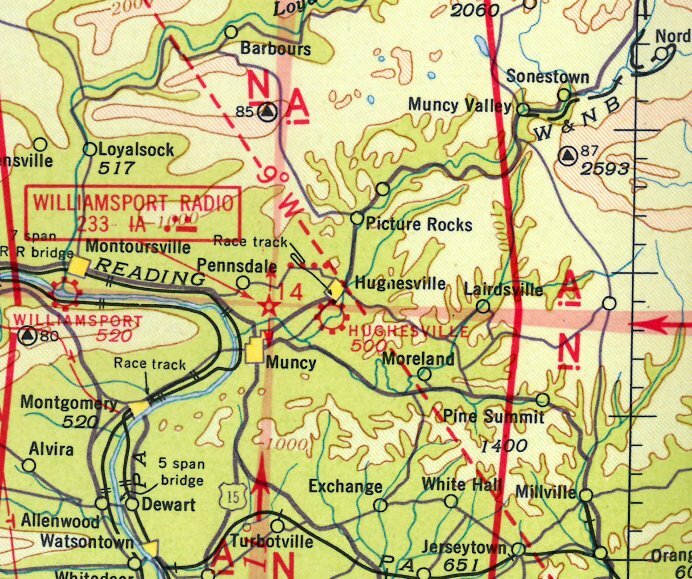 as is was not depicted at all on the 1976 PA Aeronautical Chart (according to Tom Beamer). Scott Stevens recalled, “I grew up in the nearby community of Tyrone. I spent many nights creeping into the site back in the mid 1980s. There was indeed drag racing that went on after the field closed. that may have been used to charge admission to the races. There were also the remains of some wooden bleachers. I was told by my family that before it was an airstrip it was a dirt banked race track. as the race track was his & he opened it during the depression. A 1985 photo by Scott Stevens of the main hangar, with the lettering still clearly reading “Peterson Memorial Airfield”. with “the large X painted on the runway right in front of my all-seeing teenage eyes. But as narrow & faded as it looks I would imagine hat would be hard to see from any great distance. The northern end was usually flooded due to a beaver dam between the airport & the railroad tracks. To the right of the runway are 2 buildings. On close examination one appeared to be some sort of concession stand & the other a bathroom. 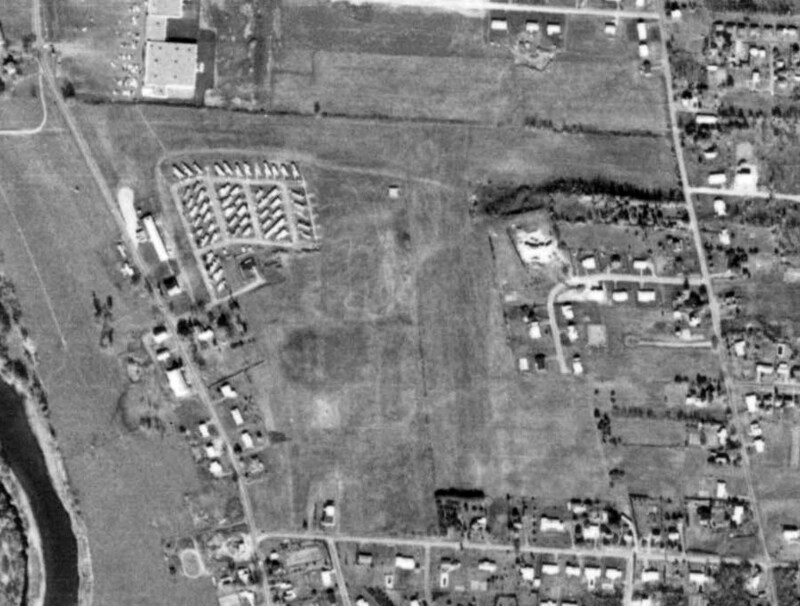 In a 1993 USGS aerial view looking northeast, most of the former Peterson Memorial Airfield runway still existed, having been reused as a street, Park Avenue. Several buildings had been constructed on either side of the former runway. A new road, Holiday Parkway, had been built crossing over the center of the former runway. but the building appears to have been removed). 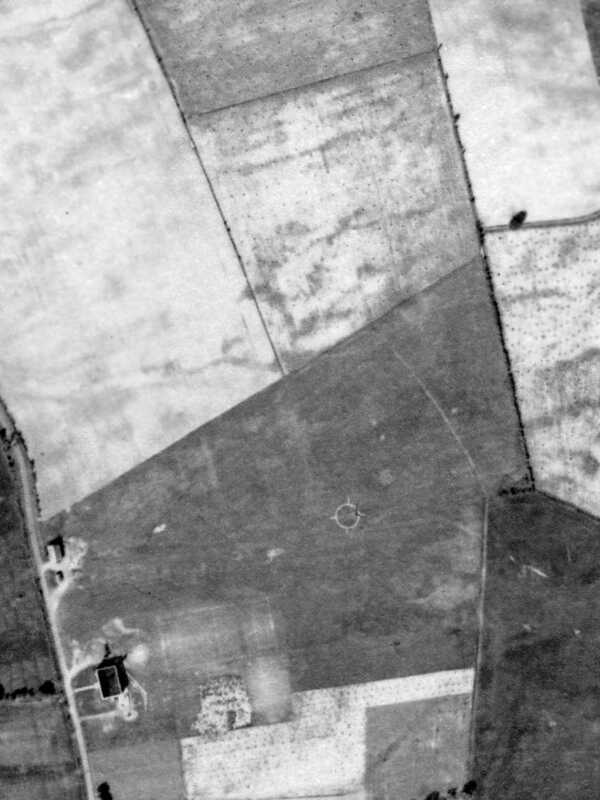 Amazingly, most of the oval outline of the racetrack which predated the airfield was also still recognizable, on the eastern side of the site. A 2003 aerial view by Paul Freeman looking southwest at the runway of the former Peterson Airfield. complete with circular turn-around pads at both ends of the former runway. A recent (2000-2005?) aerial view looking southeast at the former Peterson Airfield. It appeared as if the former main hangar still remained standing (at the top-center of the photo). 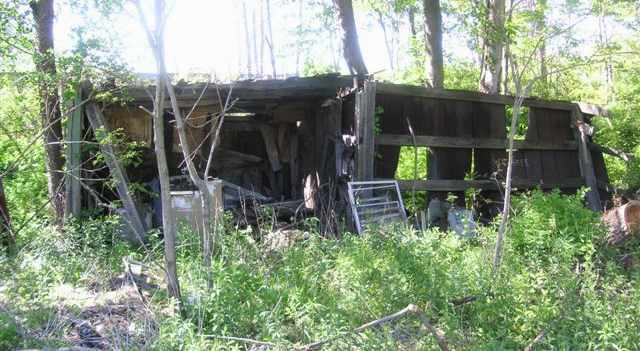 and it was being offered for sale by the Altoona Blair Development Corporation. A circa 2007 aerial view looking west at the former hangar which remains standing at the site of the 2nd Peterson Memorial Airport. A circa 2007 aerial view looking east at the end of the former runway at the site of the 2nd Peterson Memorial Airport. A 2015 aerial view looking northeast showed most of the former Peterson Memorial Airfield runway still existed, along with the hangar. 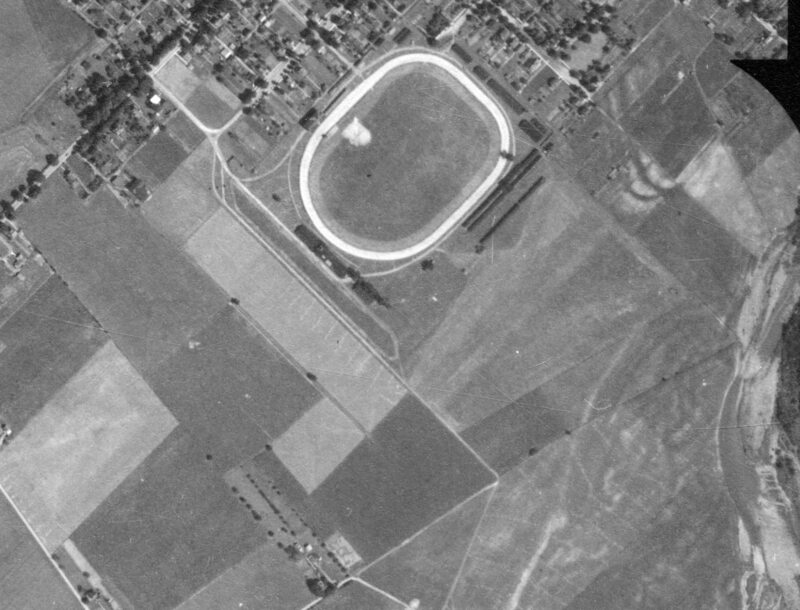 Only faint traces of the oval outline of the racetrack which predated the airfield was still recognizable (top-right). The site of the second location of Peterson Memorial Airfield is located north of the intersection of River Road & Holiday Parkway. The date of construction of the State College Air Depot has not been determined. as no airfield at this location was listed in The Airport Directory Company's 1933 Airport Directory (according to Chris Kennedy). The earliest reference to the State College Air Depot which has been located was in the 9/1/34 Commerce Department Airport Directory (according to Chris Kennedy). It described the State College Air Depot as having 2 sod runways in a "T" shape, with the longest being a 2,100' east/west strip. was an undated aerial view in The Airport Directory Company's 1937 Airport Directory (courtesy of Bob Rambo). 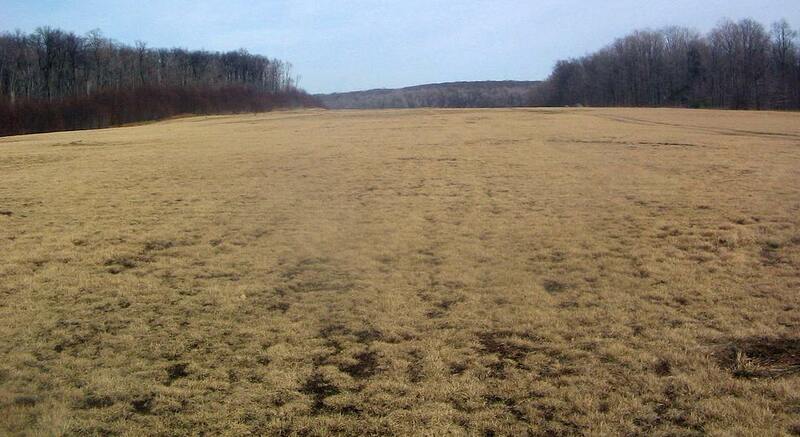 consisting of a 45 acre property having 3 sod runways, with the longest being the 2,200' north/south strip. A single hangar was pictured on the west side of the field. was on the August 1938 NY Sectional Chart (courtesy of Chris Kennedy). 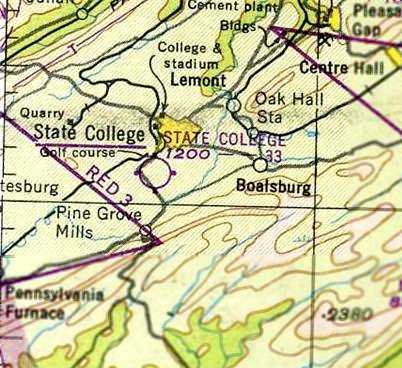 It depicted State College as a commercial/municipal airfield. with a circular airport marking in the center. but it is not evident that this building was related to the airport. 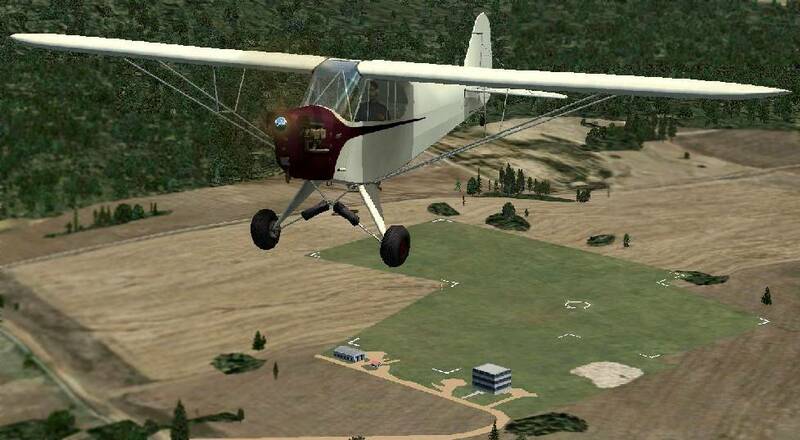 A Flight Simulator scenery recreation by Richard Finley of a Piper Cub overflying original State College Air Depot. 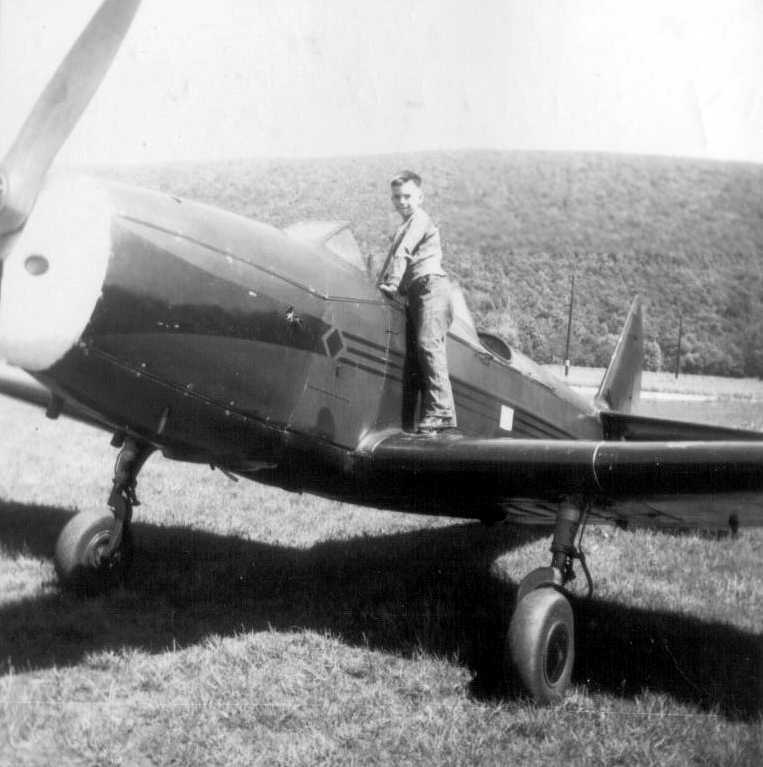 Jim McCoy reported his father took flight training with Sherm Lutz in 1939-40 at the Bloalsburg airfield location. The 1944 US Army/Navy Directory of Airfields (courtesy of Ken Mercer) described the Air Depot as having a 1,900' runway. as a 42 acre irregularly-shaped property within which were 2 sod runways, measuring 1,850' east/west & 1,700' north/south. and to be owned by private interests, and operated by State College Air Depot, Inc.
was on the November 1945 NY Sectional Chart (courtesy of Chris Kennedy). as Sherm Lutz moved his flying service to the new airfield in 1946.
as only the new airfield (on the southwest side of State College) was depicted on the January 1949 NY Sectional Chart (courtesy of Chris Kennedy). but the airfield had been reused for farming. 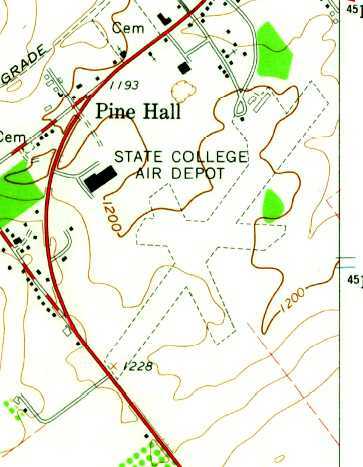 The original State College Air Depot was no longer depicted at all on the 1957 or 1962 USGS topo maps. with houses having been built along the southwest. 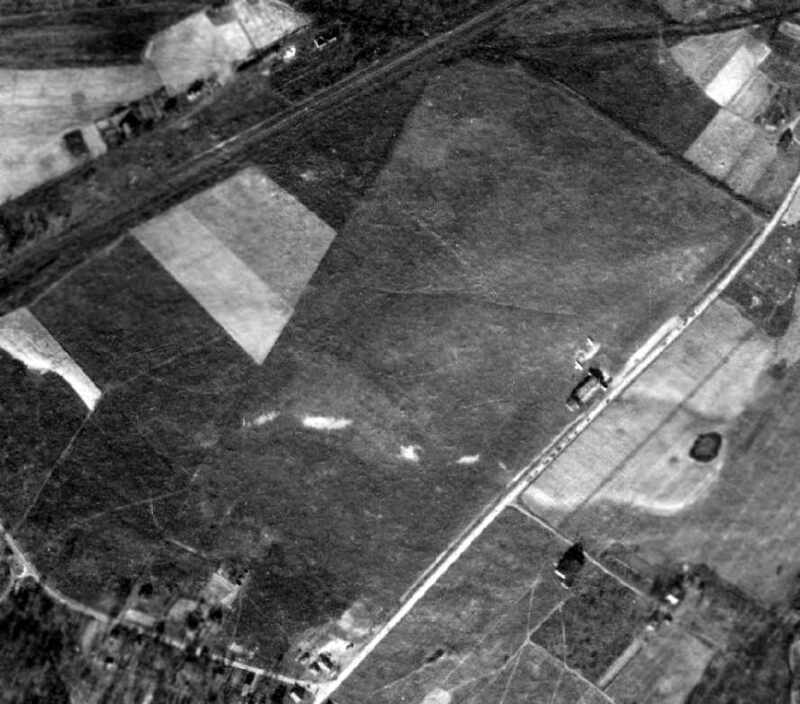 Amazingly, the larger hangar seen at the southwest corner of the airfield in the 1938 aerial photo remained standing, with houses surrounding it. 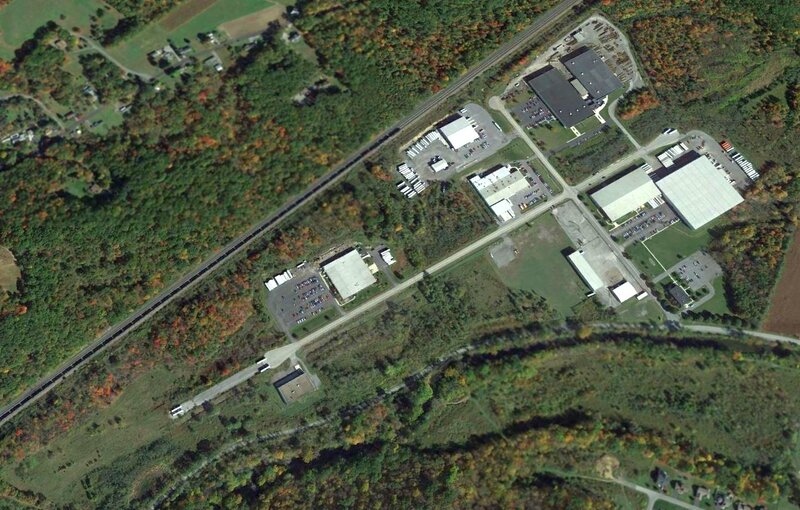 An 8/31/12 aerial view showed Route 322 & houses covering the majority of the site of the original State College Air Depot. 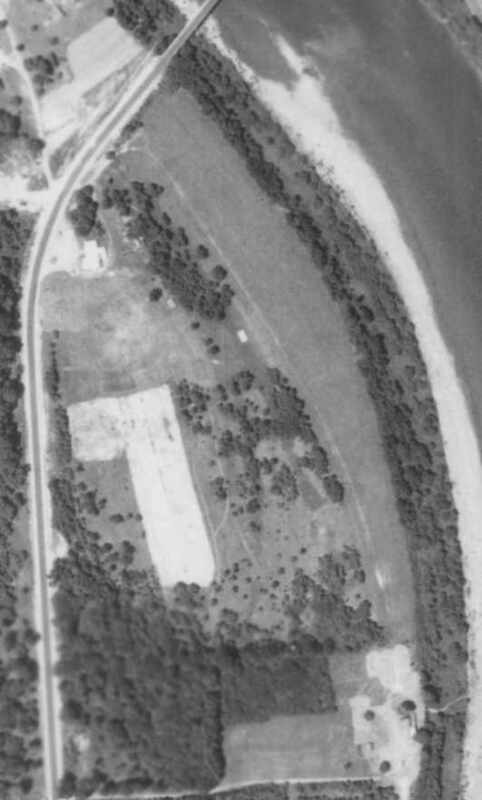 which was seen as a hangar at the southwest corner of the airfield in the 1938 aerial photo. 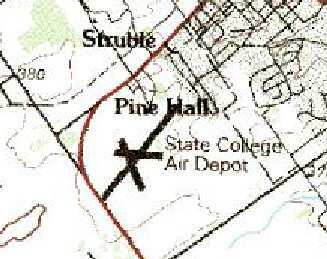 The site of the original location of State College Air Depot is located northeast of the intersection of Boalsburg Pike & Belle Avenue. as depicted on the January 1949 NY Sectional Chart (courtesy of Chris Kennedy). was replaced by a new location on the southwest side of the town. to the new State College Air Depot (on the west side of town) in 1946.
and cooperated with Penn State's aeronautical engineering & civilian pilot training programs. 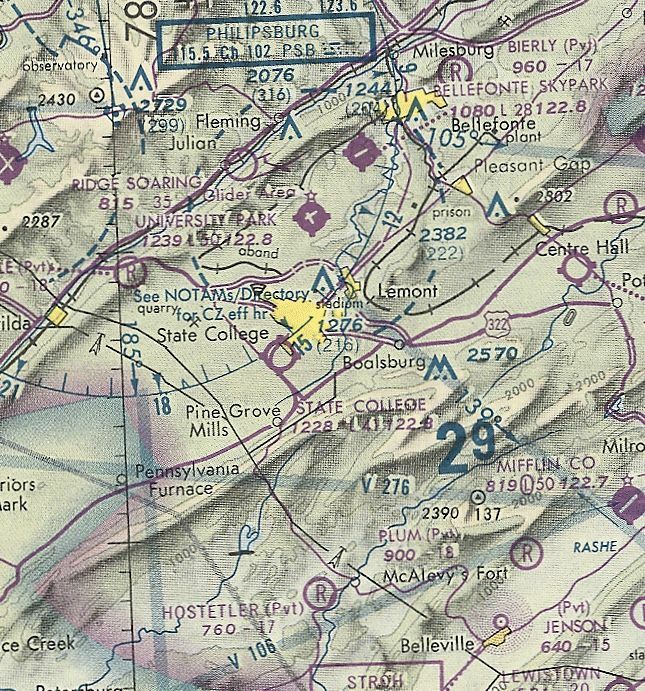 However, the 2nd location of State College Air Depot was not yet depicted on the July 1947 Cleveland Sectional Chart. was on the January 1949 NY Sectional Chart (courtesy of Chris Kennedy). It depicted the new State College Air Depot as having a 3,300' unpaved runway. and All American Airlines began scheduled flights in 1949 with the legendary DC-3s. overcoming for the first time the mountain barriers which had formerly rendered the region difficult to access. depicted State College Air Depot as having a 4,300' unpaved runway. and All American (soon to be Allegheny Airlines) ended service in 1951. 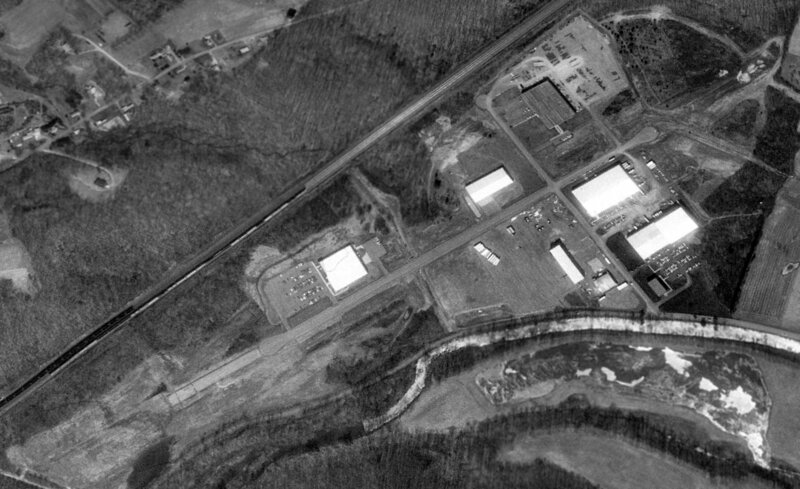 The earliest photo which has been located of the 2nd location of the State College Air Depot was a 7/2/57 aerial view of the (from Penn Pilot). It showed the field to consist of 3 grass runways with 2 rows of hangars at the north end. with the longest being the 4,250' Runway 4/22. A small ramp on the north side of the field had several small buildings (hangars?). as having 3 turf runways: 4,250' Runway 4/22, 2,000' Runway 15/33, and 1,600' Runway 9/27. The operator was listed as State College Air Depot, Inc. 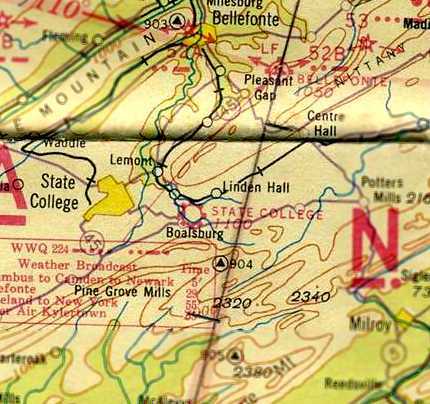 The earliest topo map depiction which has been located of the State College Air Depot was on the 1962 USGS topo map. 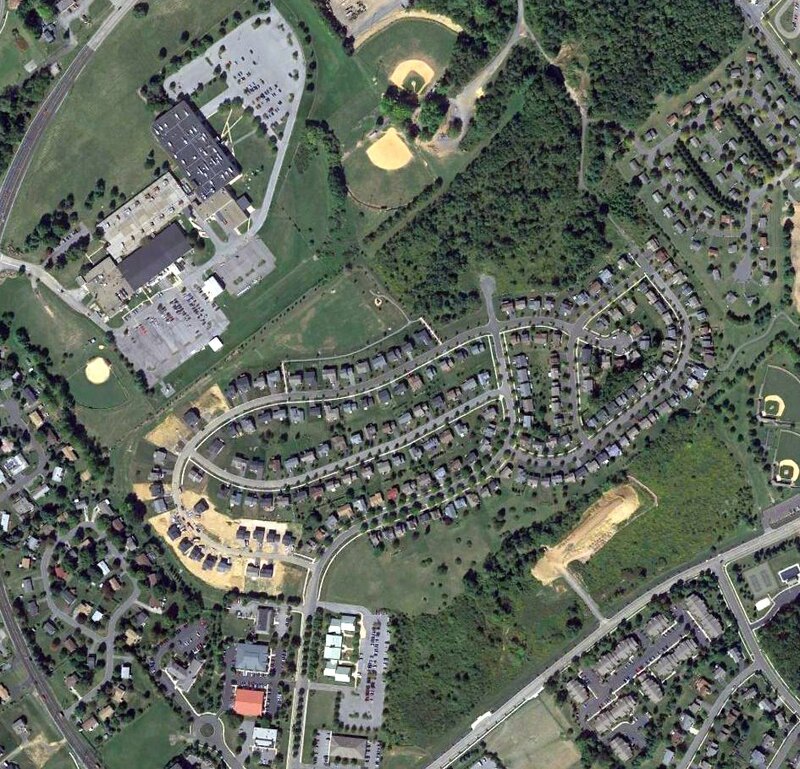 It depicted State College as having 3 unpaved runways, with several small buildings on the north side. A Flight Simulator scenery recreation by Richard Finley of a Cessna 152 overflying State College Air Depot. depicted State College Air Deport as having a 4,200' unpaved runway. depicted the field as having 3 grass runways, with a few small buildings on the northwest side of the field. depicted the 3 grass runways, and the cluster of hangars at the north end of the field. According to Rodney Hersh, “I learned to fly from Sherm Lutz in the early 1970s. Alan Uhler recalled, “My father's airplane, a 1947 Stinson 108-3 was based at Sherm Lutz's airport in 1980-81.
to be careful not to use the extreme westward end of the remaining runway as it still had ruts in it from the DC-3s. As a 10 year old, his airport was a really neat place to be. it was a frustrating airport as he could not get the hangar doors open between late November & sometime in March, [due to] frost heaving. The last aeronautical chart depiction which has been located of State College Air Depot was on the May 1981 Detroit Sectional Chart (courtesy of Ron Plante). It depicted State College Air as having a 4,100' unpaved runway. apparently the 2 shorter strips had been abandoned, as the 4,350' turf Runway 4/22 was the sole runway listed. Joe Rossi recalled of State College Air Depot, “Back in the early 1980s I used to fly singles to a small airfield in downtown State College. It was a grass strip & unattended. 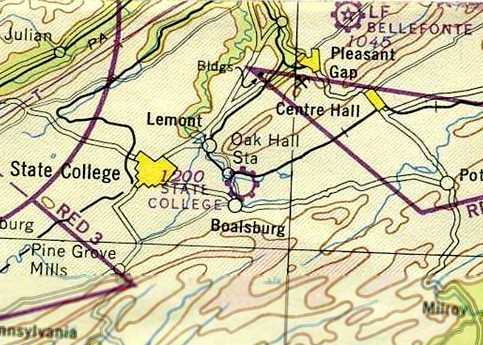 The 1985 USGS topo map still depicted State College Air Depot as having 3 runways. as having a single 4,065' turf Runway 4/22. with several buildings on the north side of the field. According to Erik Wagner, "I think I still have an approach plate for State College. It had an instrument approach into the grass runway until the 1980s when it closed." although homes had been built over the 2 ends of the former runway. 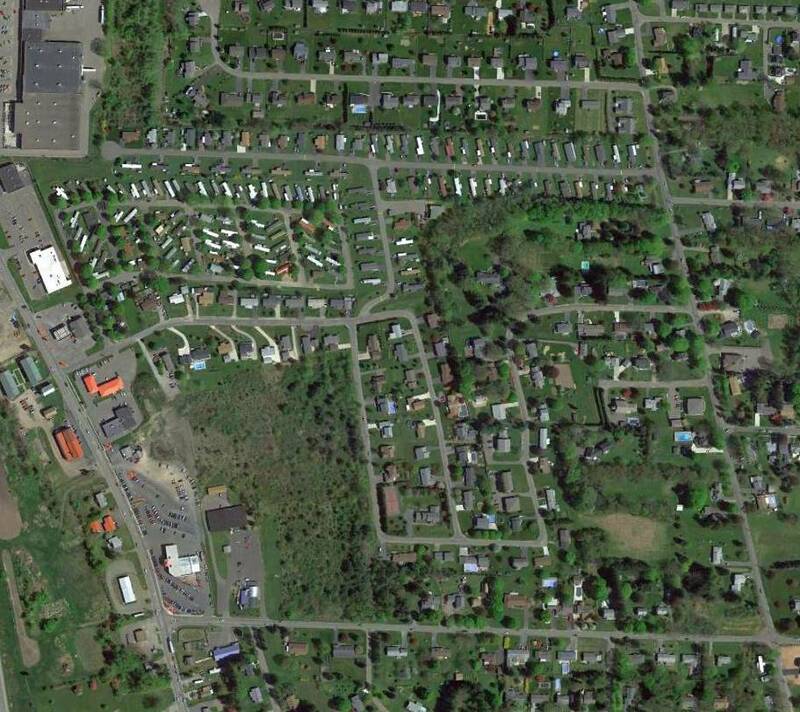 (the long, narrow white buildings just east of the former airport entrance road at the north end of the photo). 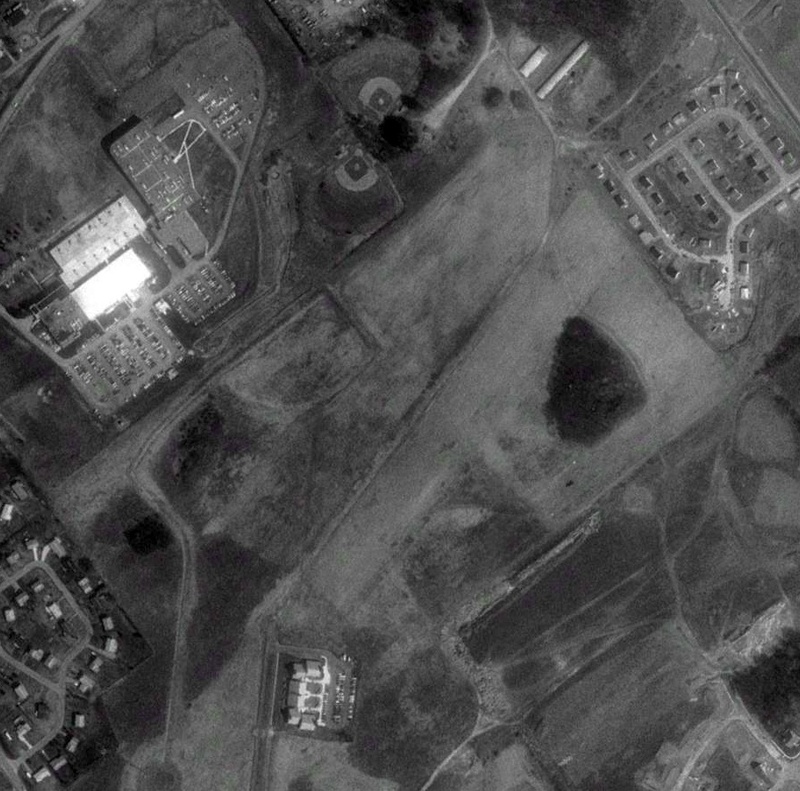 A 2015 aerial photo showed a housing development had covered the site of State College Air Depot. 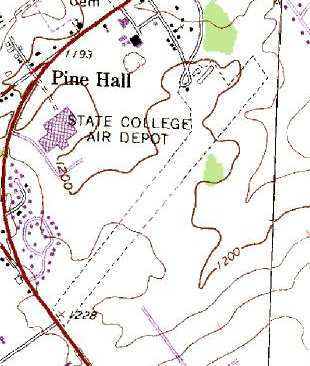 The site of the 2nd State College Air Depot is located south of the intersection of Route 26 & Airport Road.